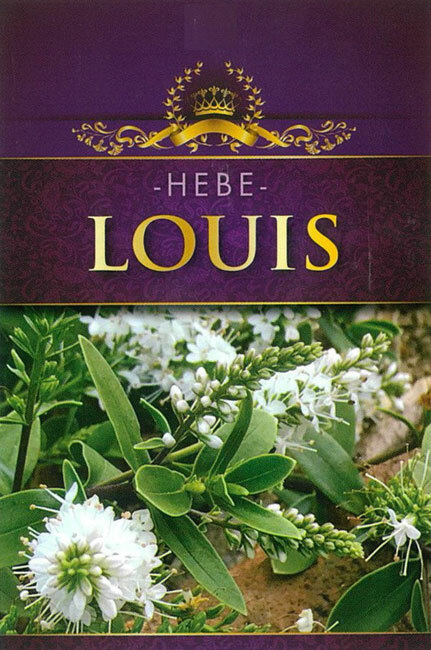 New Release Hebe’s from Growing Spectrum. 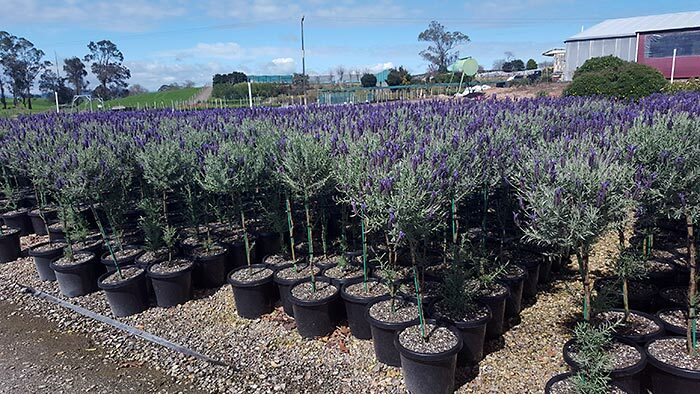 Bred in the Waikato and for New Zealand conditions these NZ natives are versatile and hardy making them a very appealing plant for the garden. 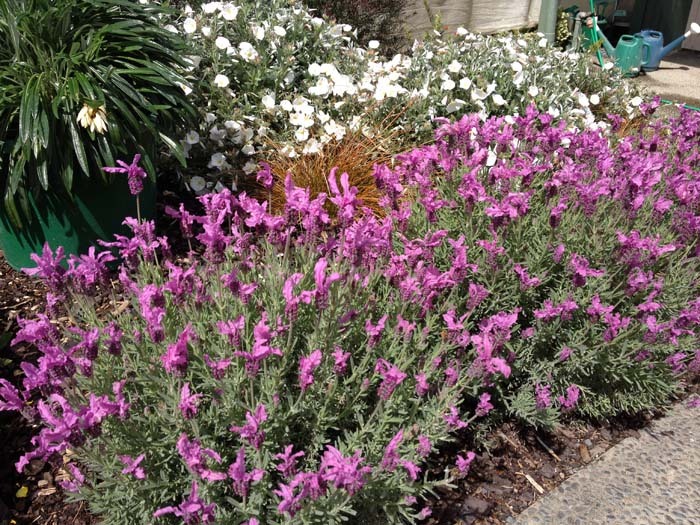 • Masses of pale mauve flowers in the summer. 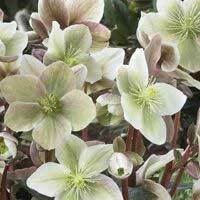 Hellebores and commonly known as ‘winter roses’ are one of Growing Spectrums favourite winter colour crops. 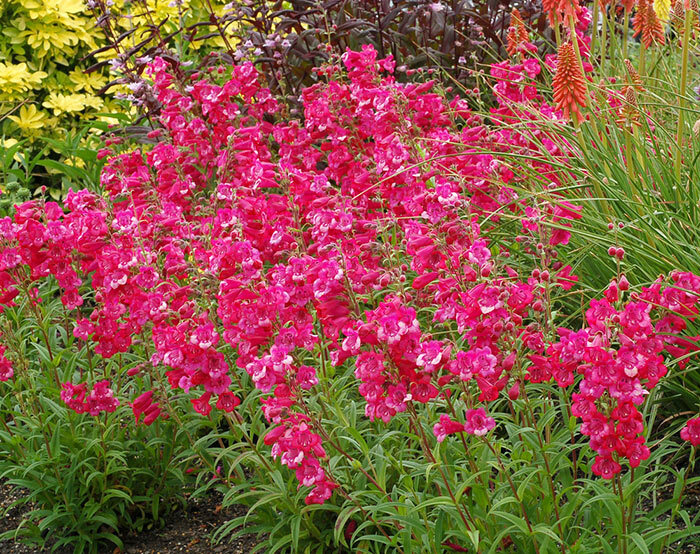 These wonderful perennials have become a popular plant for gardeners, who each year wait for the exciting new varieties to be released. 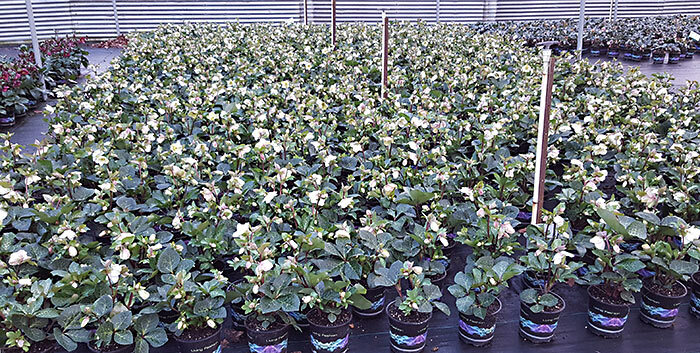 Last week our propagation team have been busy, carefully preparing the Hellebore tissue which takes 18 months and serval different stages of production before becoming the flowering plants we supply to Garden Centres in winter 2020. 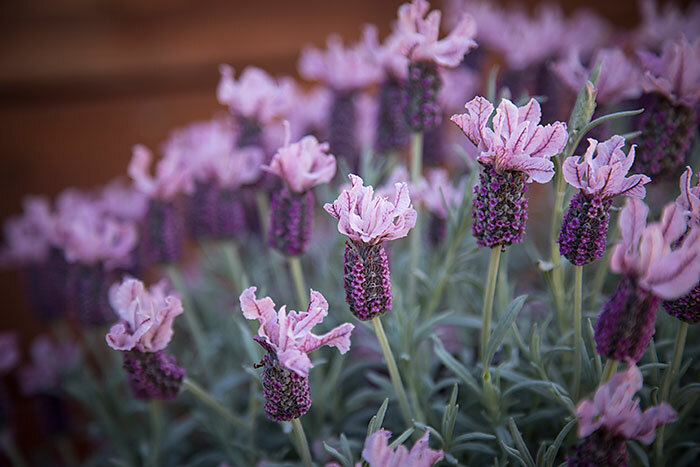 Lavender ‘Sweet Romance’ a variety of the English Lavandula, is one of the most highly fragrant crops we grow on the Nursery. 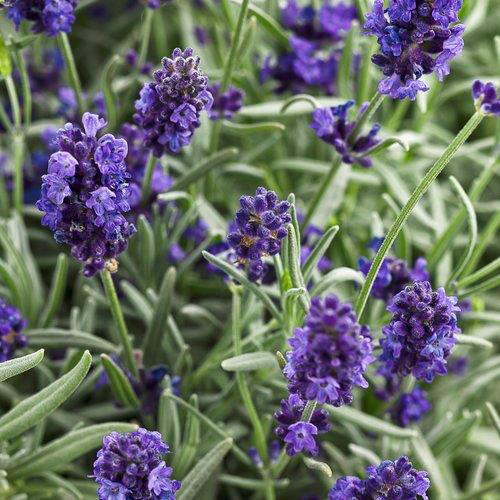 Lavender ‘Sweet Romance’ is a compact form producing masses of intensely fragrant, deep blue-mauve flowers early summer through to early autumn. 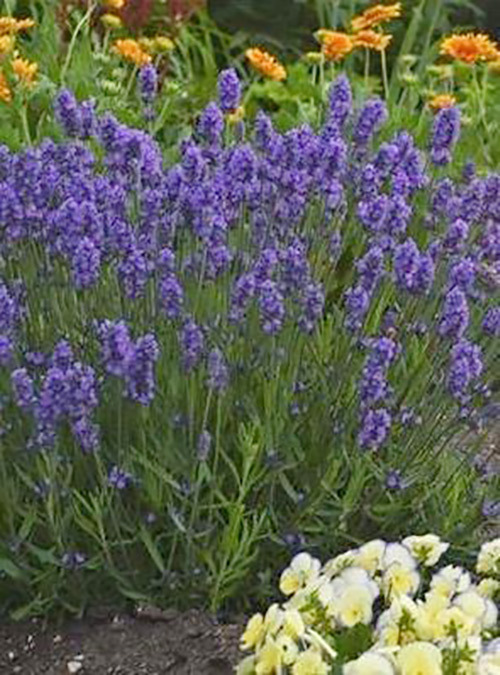 Lavender ‘Sweet Romance’ prefers to be planted in a sunny position with good drainage. 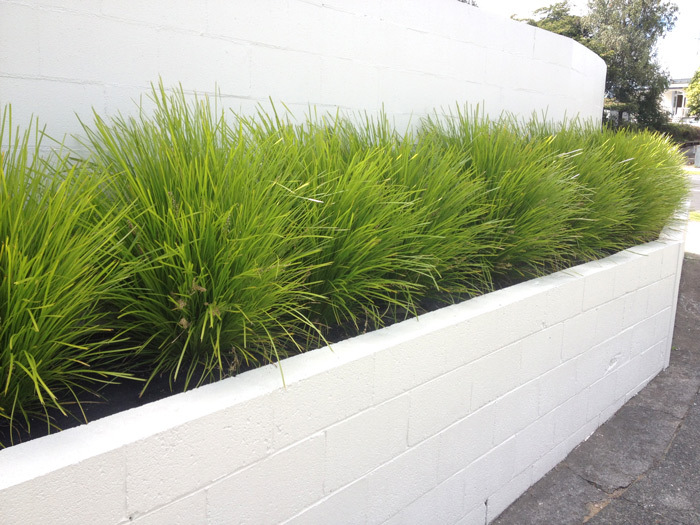 When looking for a plant that survives the toughest conditions consideration must be given to Lomandra Lime Tuff. 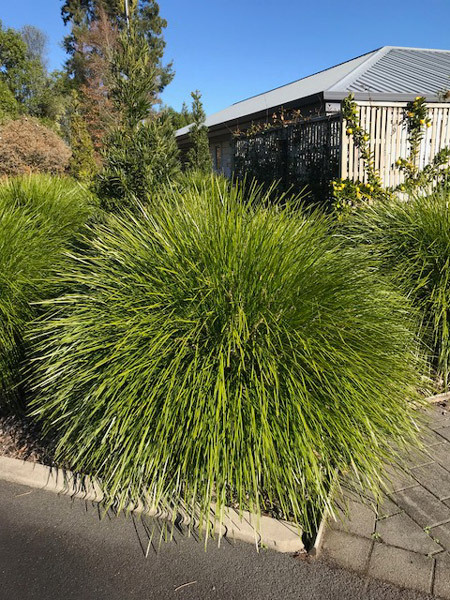 This fantastic versatile, easy care perennial grass bred in Australia, tolerates hot dry positions or part shade. 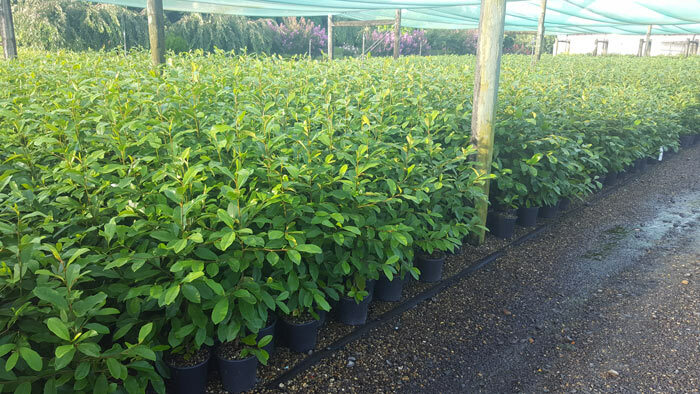 The fine lime green foliage which stays lush all year round, adds texture to the garden making it perfect for mass planting. 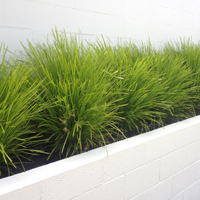 As with many of our plants at Growing Spectrum Lomandra Lime Tuff is produced by tissue culture. 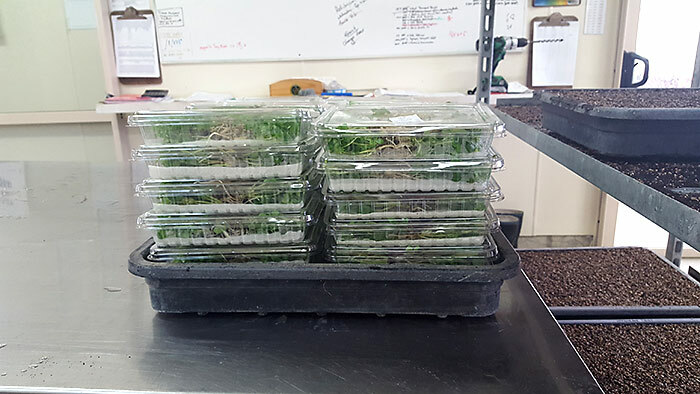 Tissue Culture is a technique where cells or pieces of tissue are taken from the original mother plant in laboratories, which are then grown under sterile conditions where they form tiny plants identical to the ‘Mother’ plant. 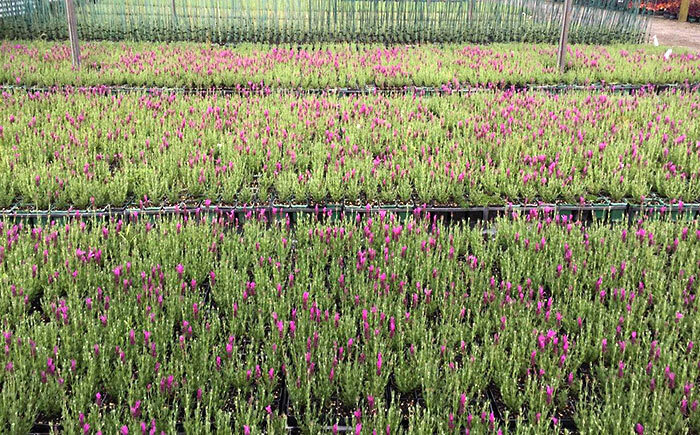 At Growing Spectrum these tiny plants are placed put into production and grown at the Nursery until they are ready sold to Garden centres. 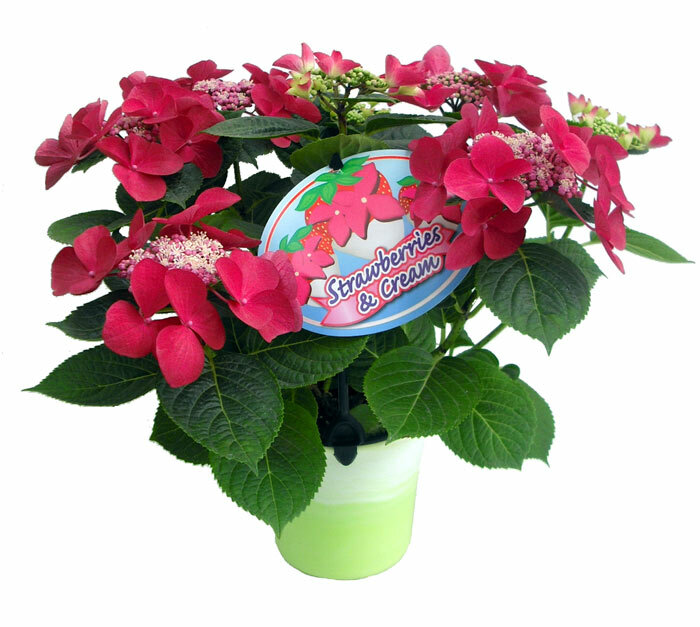 For some time now one of Growing Spectrums old time favourites the Hydrangea, has gained popularity. 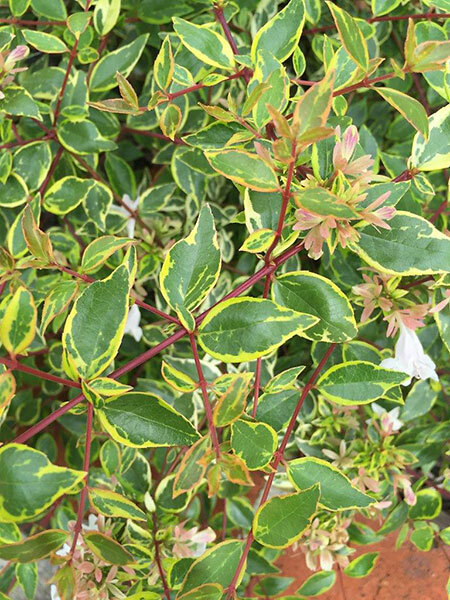 These easy-care shrubs are sold to garden centres from September onwards when they are dormant, right through as they come into flower during the months of November and December. 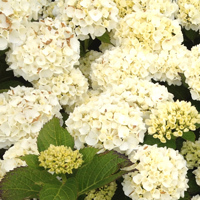 With new and advanced breeding, the selection of Hydrangeas now available to gardeners are stunning, ranging from compact free flowering to the taller growing paniculata varieties. Hydrangeas grow best in a morning sun position with protection from the hottest part of the day. 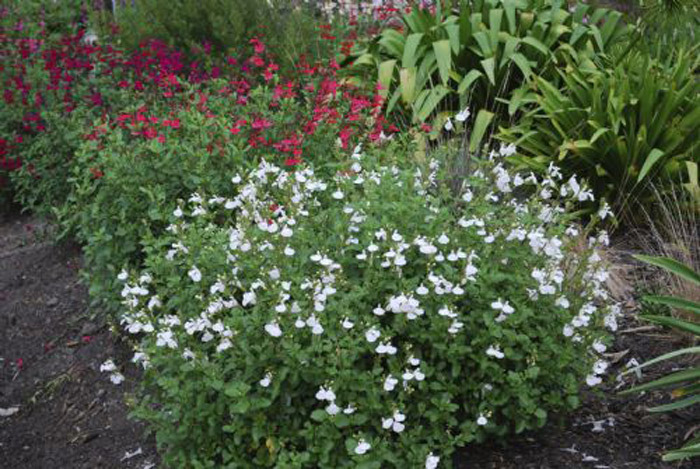 Improve the soil before planting by adding plenty of compost or organic matter. 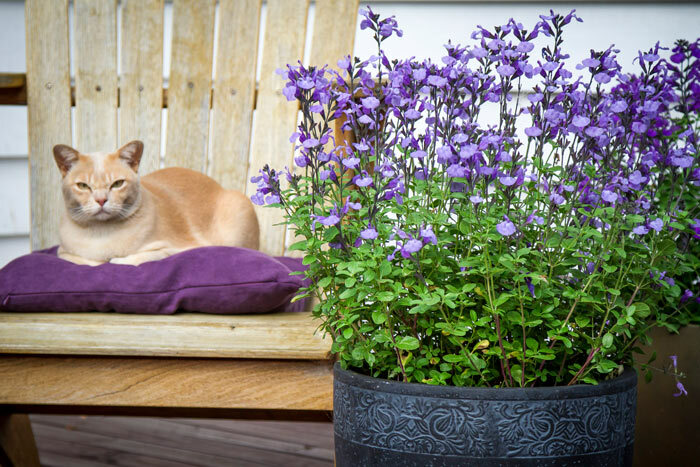 Keeping the plant well-watered is important while the blooms are forming. 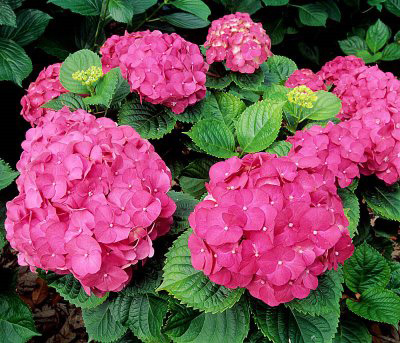 Fertilise Hydrangeas early Spring. 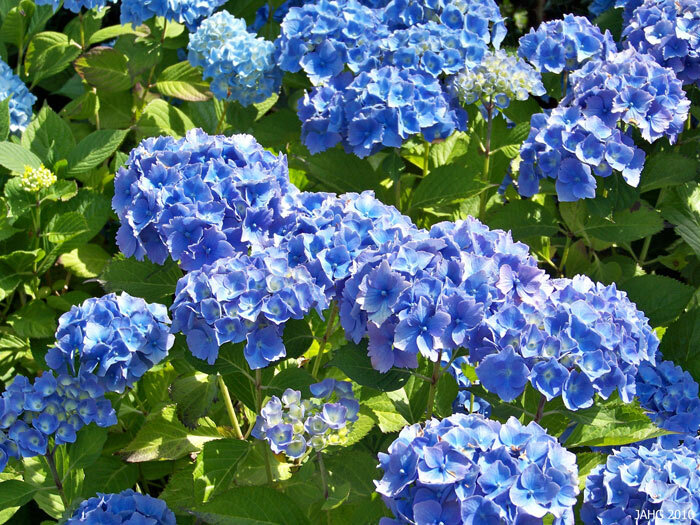 To maintain the colour of your Hydrangea, apply Epsom salts for blue flowers and garden lime for pink flowers. 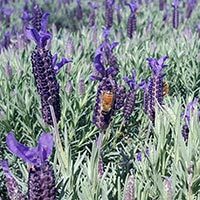 Plants will benefit from an application of organic matter during their growing season. 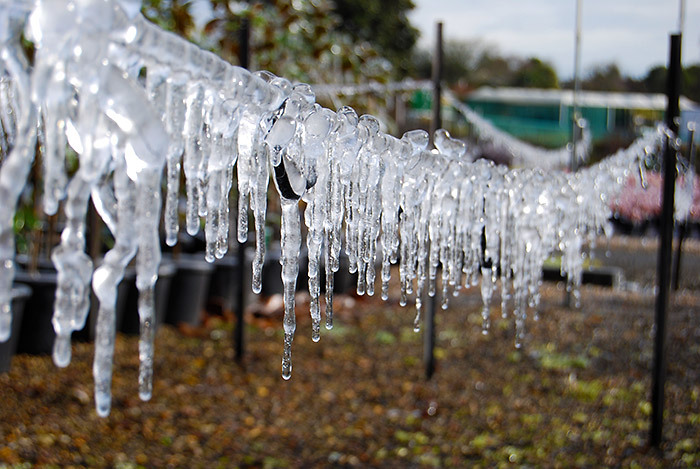 Prune during the winter when plants are dormant. 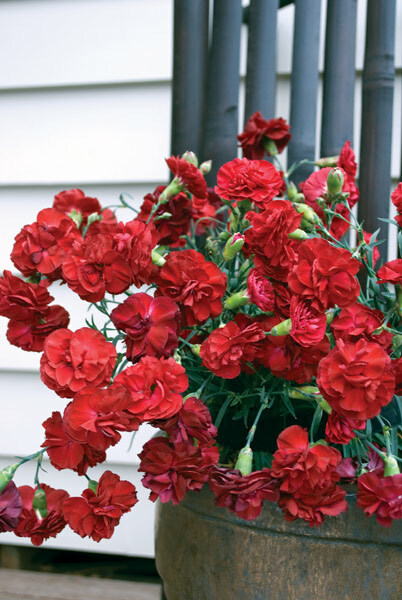 Cut back the stems that have produced flowers to the double buds forming. The un-flowered shoots will produce next season's blooms. 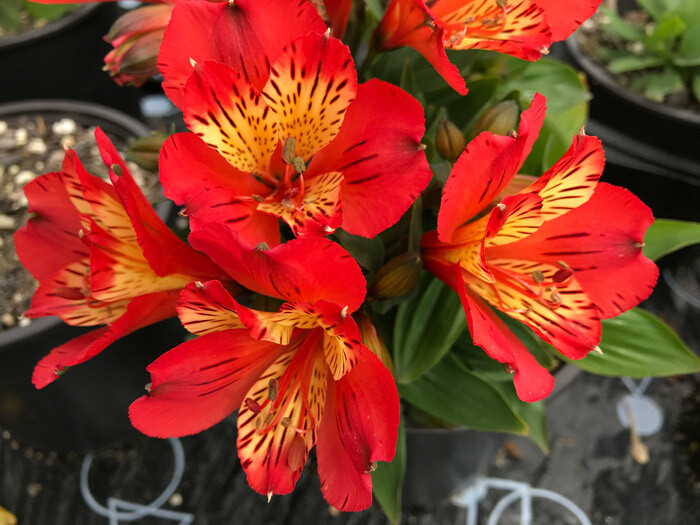 The range of Inca Alstroemerias we produce at Growing Spectrum have proven to be one of our most popular perennial plants we send into garden centres during spring. The range of colours are divine, ranging from soft pastels to the bright and vibrant tones of orange and red. 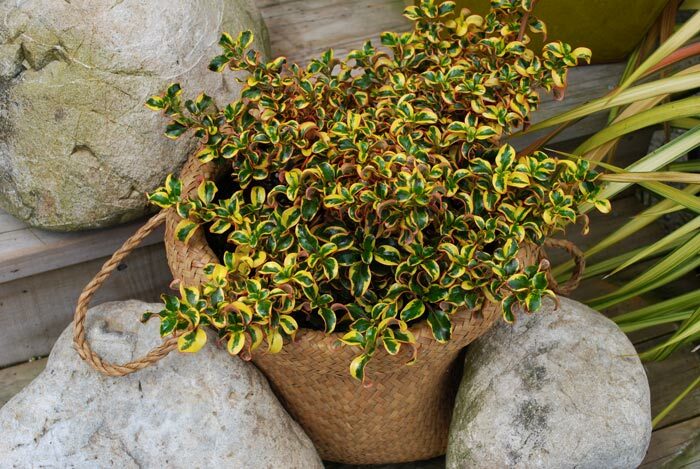 Planted in the garden or in a container the Incas have a medium habit and with minimal care these plants will reward the gardener with flowers for months from spring through to Autumn. 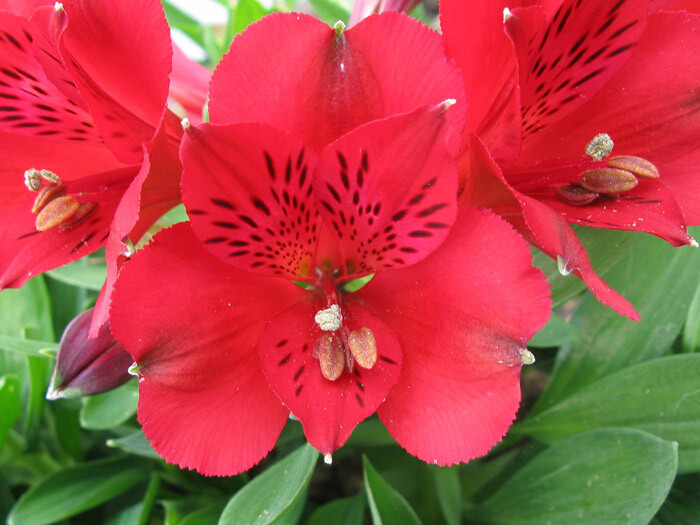 • To stimulate the plant to produce new flower spikes Alstroemerias benefit from pulling off the dead flower stems at the base. 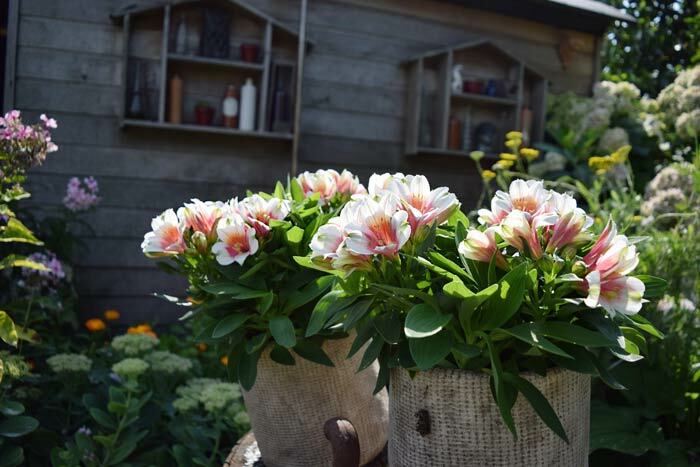 • Once plants establish themselves divide them by lifting in the winter months, this will ensure you get a mix of flower producing and vegetative tubers. 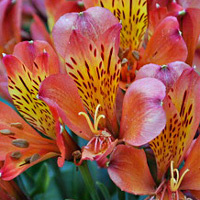 • Alstroemerias benefit from feeding, apply a slow release fertilizer early spring and autumn. 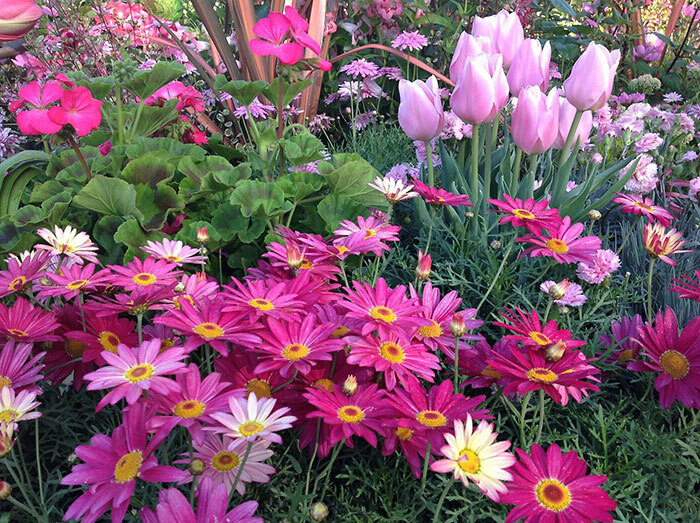 If planted in the garden add an organic mulch early spring. 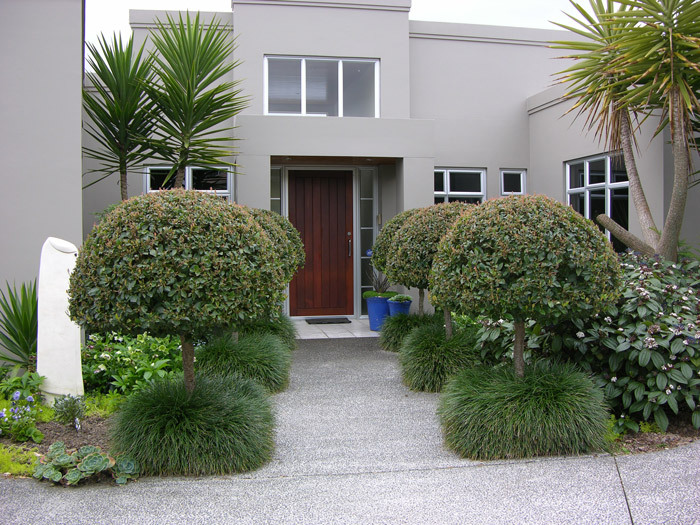 Topiary - The art of clipping shrubs or trees into ornamental shapes. 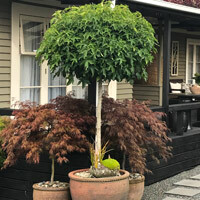 Whether it’s enhancing the garden with a stunning focal point or giving containers that ‘wow’ factor, topiary plants give a sense of depth, drama and elegance to any garden setting. 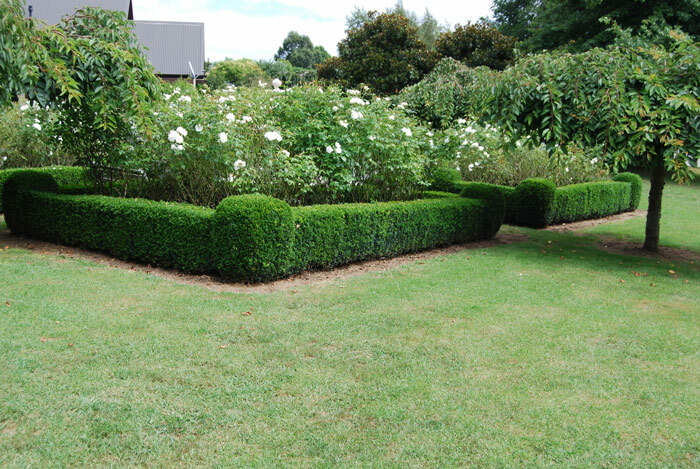 Topiaries can be planted as single specimens, planted in a row for more formal setting or simply grouped in containers. 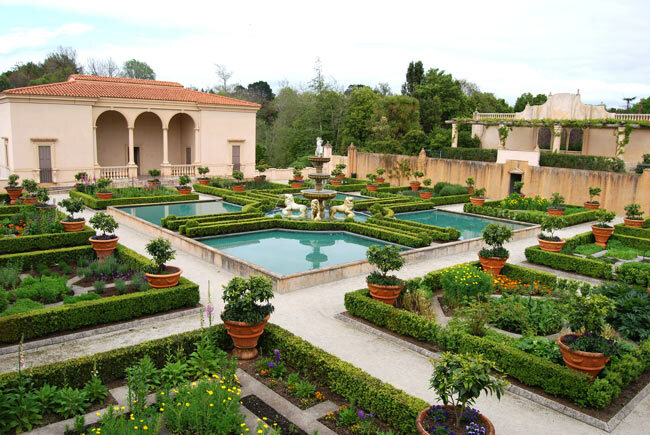 To keep their shape most topiaries will need trimming. 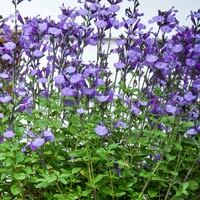 Generally, lightly trim to shape in August before their spring growth and once again early autumn. 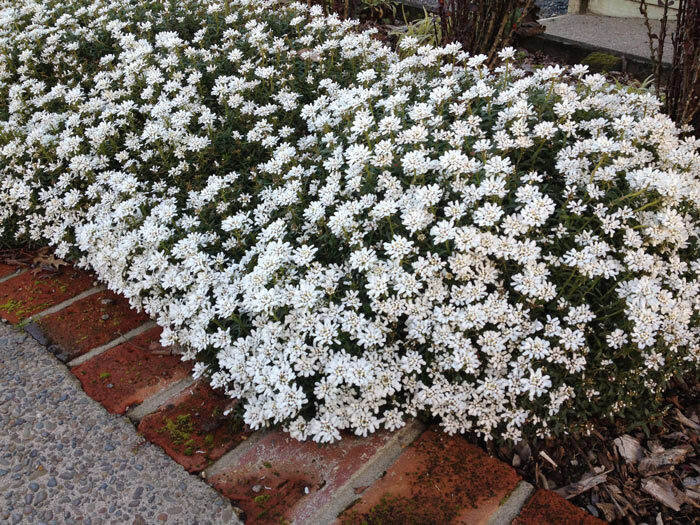 If your topiary plant has flowers trim these off after flowering. Sterilize tools before trimming to stop the spread of plant diseases from one plant to another. Apply a slow release fertilizer and a handful of sheep pallets early spring. To maintain good health during the summer months, add a liquid feed every two or three weeks of Phostrogen or seaweed fertilizer. 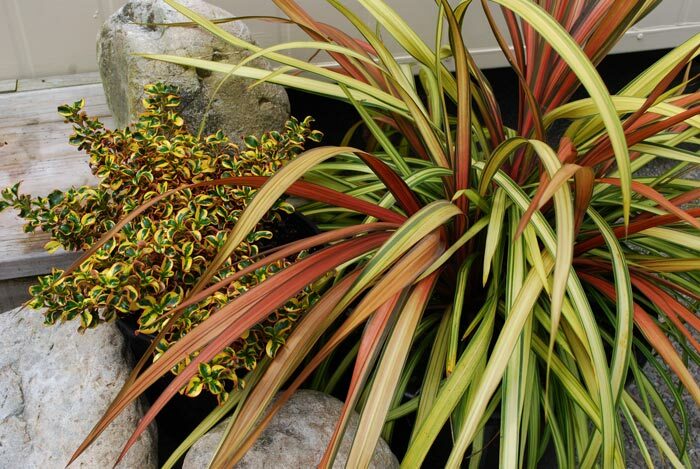 During dry periods it is important to water regularly, do not allow your plant to dry out. 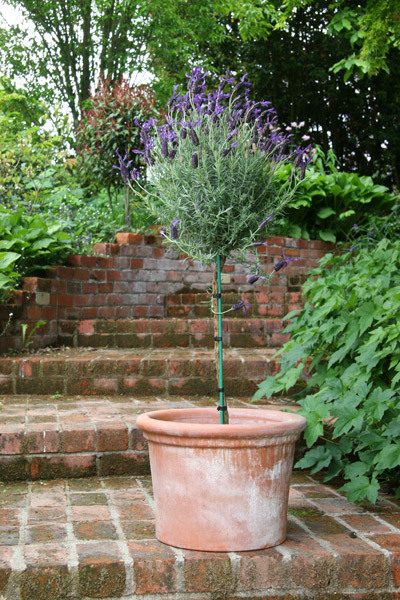 If cared for topiary plants can happy remain in the same container for up to two to three years, however check annually that the container plants have not become pot bound. 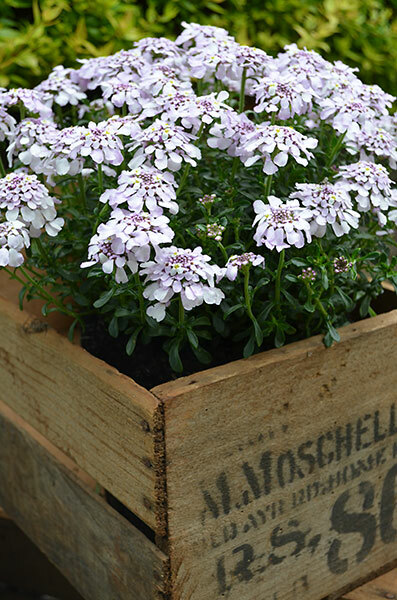 When purchasing a new container ensure it is several centimetres wider than the root ball, and even bigger for larger topiary plants. 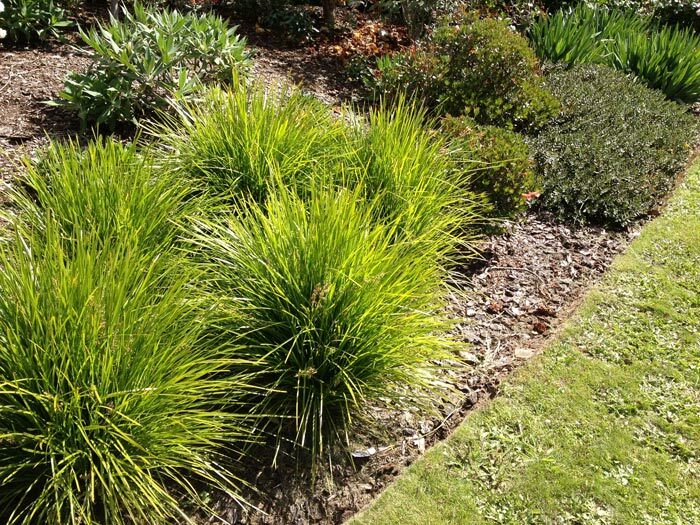 For newly established garden grown topiary plants extra care must be taken, ensuring regular watering during the summer months and light watering in winter. 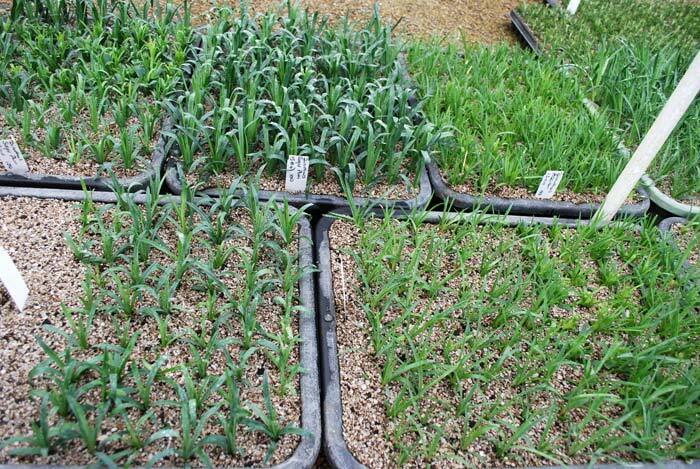 Fertilize early spring with a slow release fertiliser along with a generous application of organic sheep pallets. 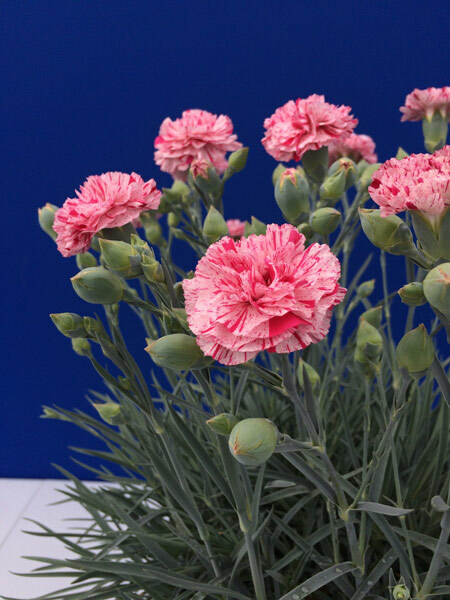 For the last few years the wide range of Dianthus we grow under the ‘Living Fashion’ brand have been a favourite for gardeners. 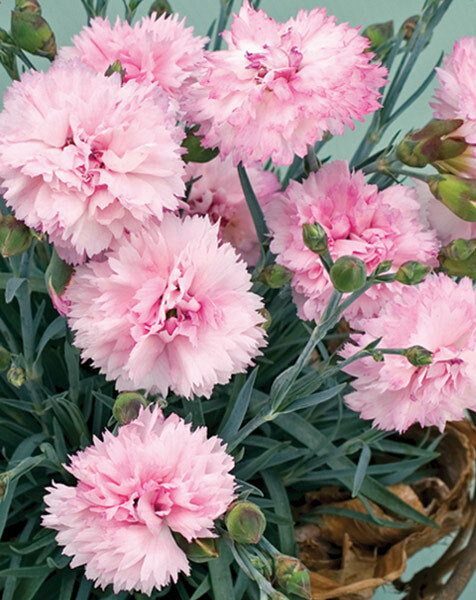 These ‘Magnifi-Scent’ series of Dianthus are ideal as a smaller perennial at the front of a border or as a low stimulate further flower flushes. Feed with slow release fertilizer in early spring for best performance. Quick to establish, very easy care. Evergreen. 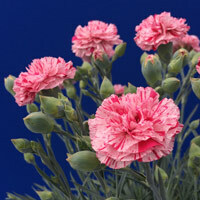 This beautiful new Dianthus produces fragrant, double ruffled flowers speckled pink and white. 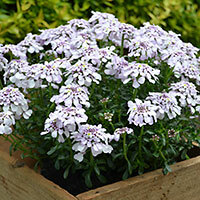 Perfect for use as a picking flower or a border plant in the garden. 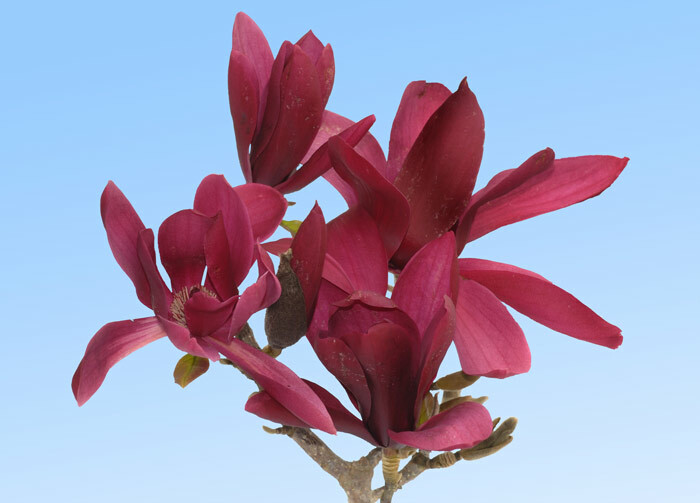 One of Growing Spectrums speciality crops are deciduous Magnolias. Over the past four weeks our teams have been busy processing and sending these trees out to Garden Centres. 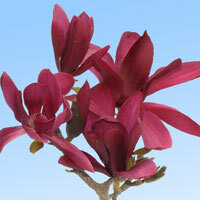 The magnificent flowers of a deciduous Magnolia tree are one of the most striking to be found in the winter garden. 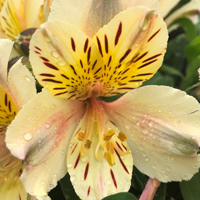 With several different varieties to choose from, the fabulous and often fragrant flowers come in many different forms and colours ranging from white, pink, purple or yellow. 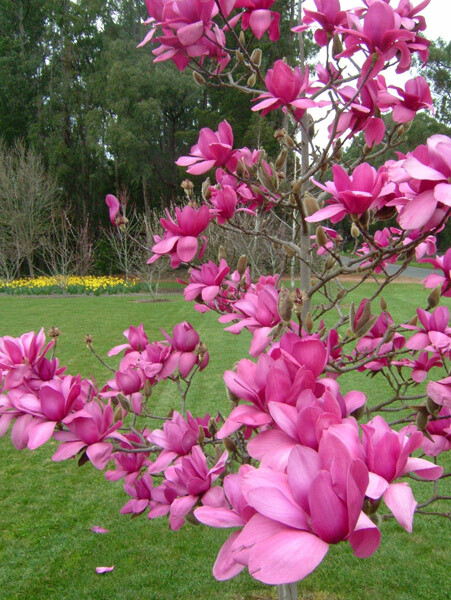 Given the space Magnolias are easy to grow, require very little maintenance and are well worth considering as feature plant in the garden. The long nights and short days of winter have a habit of feeling endless and it’s during this time we look for any small sign that spring is on its way. 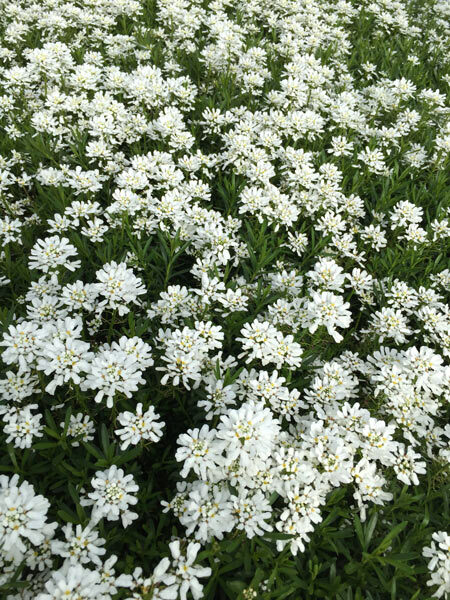 One of the most delightful, early flowering plants we grow, and which gives us a peak at the season ahead is Iberis Snow Top also known as perennial Candytuft. 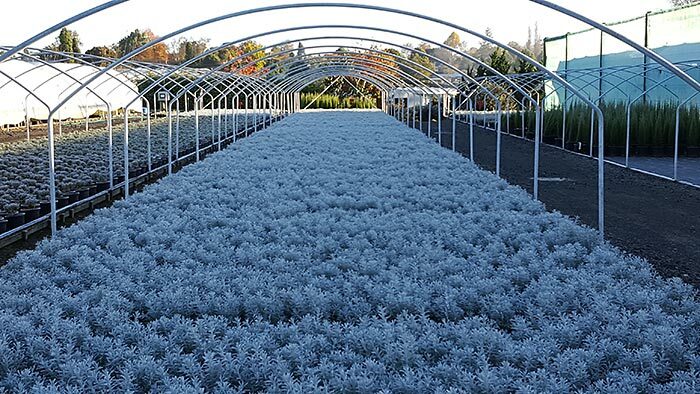 This cold hardy is a little ground cover with evergreen foliage is covers itself with a blanket of large clusters of snow white flowers from early winter to late spring. 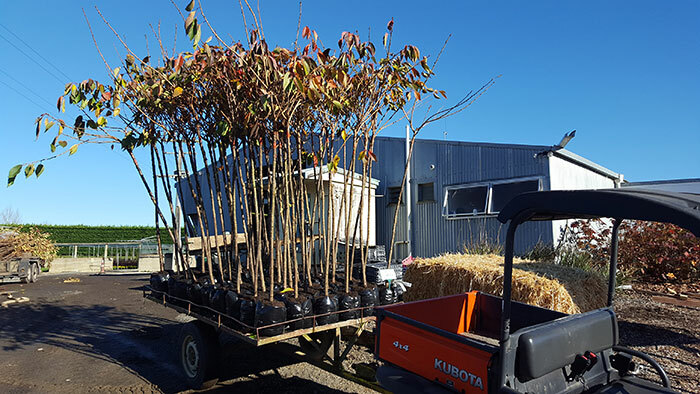 The constant cycle of Nursery production certainly comes around quickly and once again we find ourselves at Growing Spectrum preparing to process the many varieties of deciduous trees which have been growing at our open ground nursery for the past two or three years. 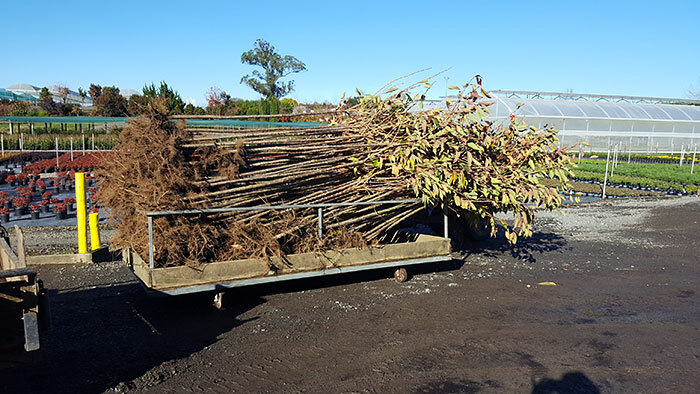 On those cold and sometimes frosty Waikato mornings our teams at Growing Spectrum will spend the next couple of months, bagging, potting and dispatching these trees into garden centres who will have customers waiting for these beautiful seasonal specimens. 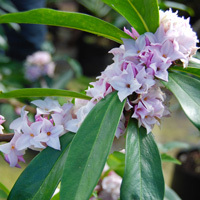 Daphne Perfume Princess™ was released in 2015 and since this time has become one of the most popular crops Growing Spectrum produce, and one that sells out each year. 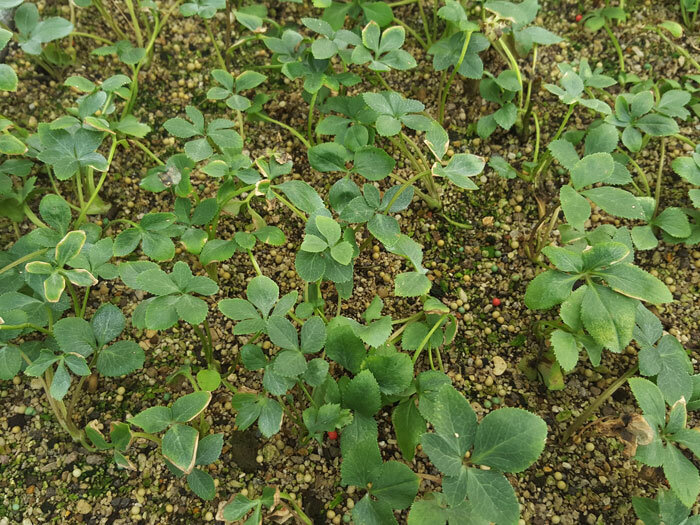 Production of this crop is done in several stages and recently our experts in the propagation team have been busy taking cuttings from stock plants which will form part of the crop we will send out to Garden Centres in 2019. 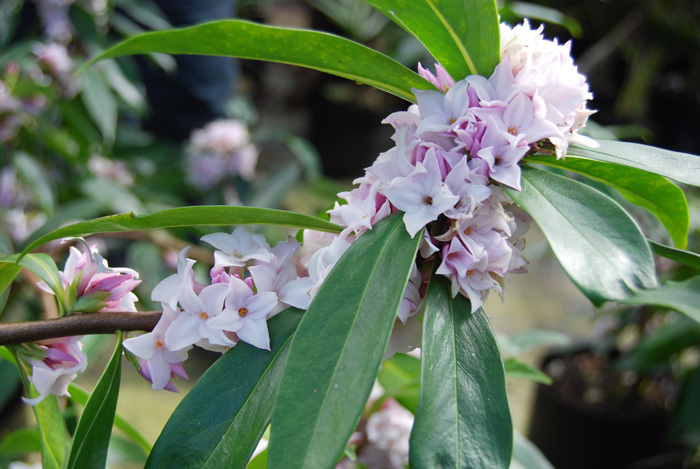 Daphne Perfume Princess™ is not the only Daphne we produce, however the key features listed below have proved it to be an all-time favourite for gardeners. 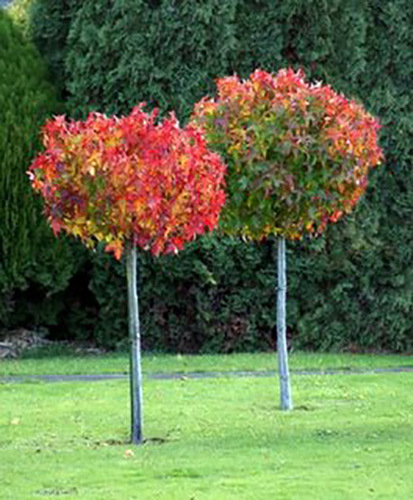 Topiary plants are one of Growing Spectrums speciality crops and one of the most stunning varieties we produce is Liquidambar ‘Gumball’, commonly known as the ‘Lollipop Sweetgum’. 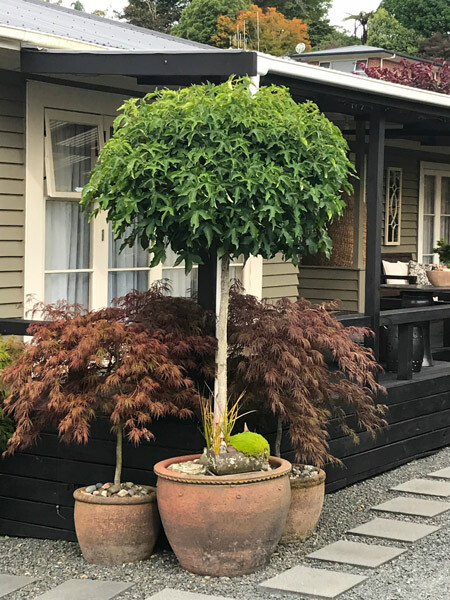 This beautiful topiary plant is grown in the shape of a super-sized lollipop and produces lush lime green growth in spring which deepens to a dark emerald green in summer, then with the onset of autumn the leaves turn brilliant orange-red and wine-purple which hold into winter. 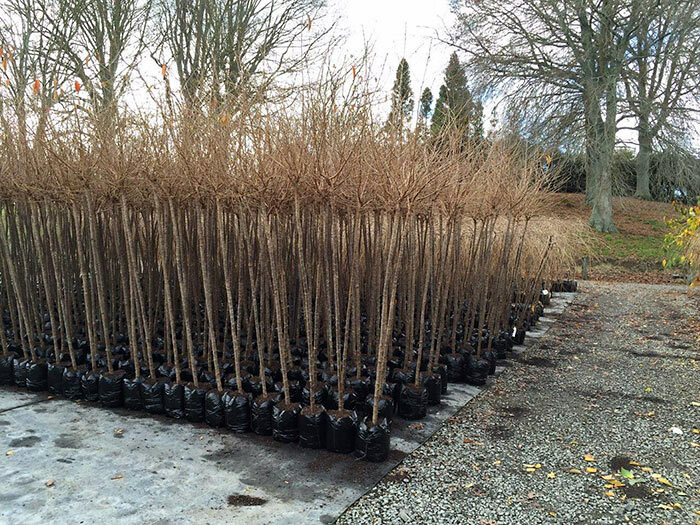 To create this lovely topiary our teams at Growing Spectrum have been preparing the trees for grafting which is a specialised technique that requires careful preparation and precision over two years. 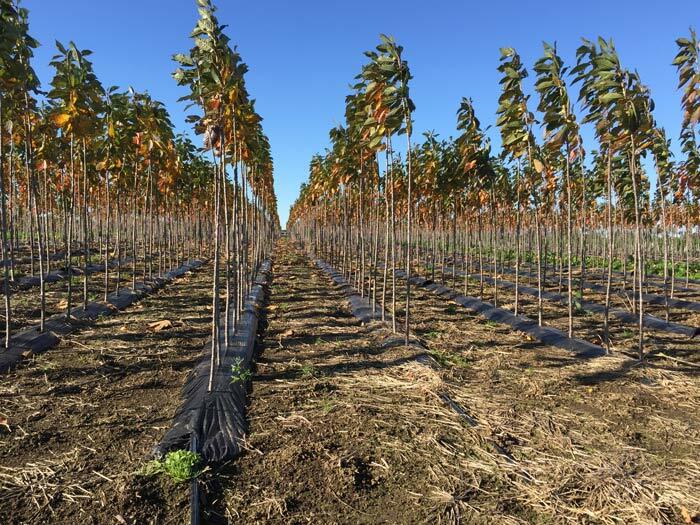 They then take buds from the naturally dwarf growing ‘Gumball’ variety and graft them onto the 2 year old Liquidambar trees at the desired height. 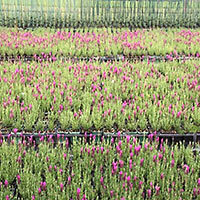 After this process is complete the plants are left on the Nursery for a further 12months to grow. 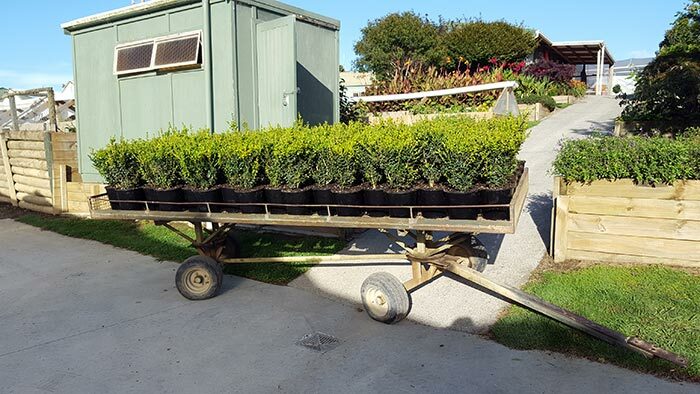 During this time, they will be carefully trimmed and shaped into a topiary, ready for supply into garden centres throughout the North Island. 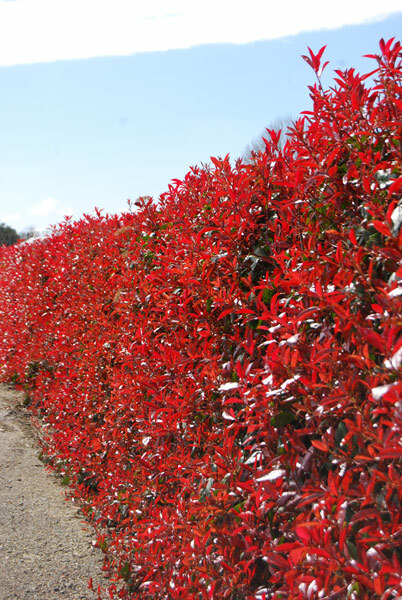 With Autumn fast approaching now is the perfect time to start planning and planting hedges. 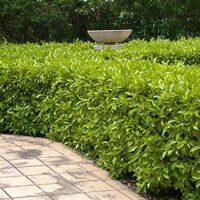 Hedging and screening plants will not only give shade and privacy but also add beauty and style to your garden. 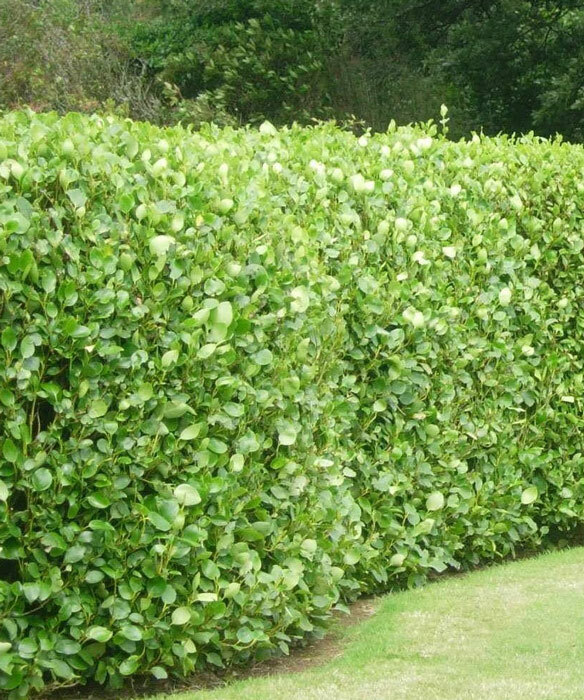 Once established both hedging and screening plants, can be trimmed into formal hedges or left to grow as informal screens. 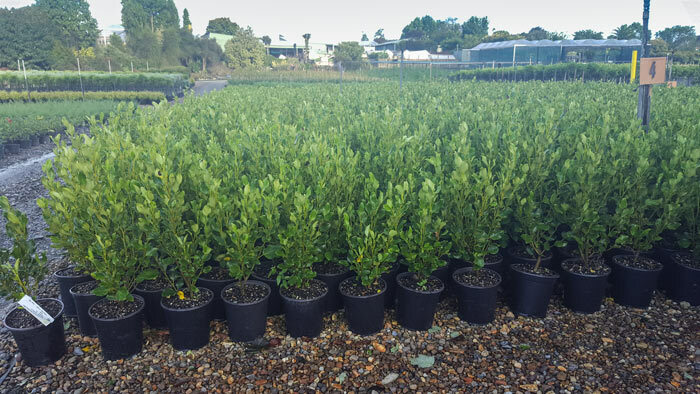 The top selling evergreen hedging and screening plants we grow at Growing Spectrum are Griselinia Broadway Mint, Camellia Sasanqua Setsugekka, Michelia Figo, Buxus Sempervirens, Photonia Red Robin, Feijoas and a stunning range of evergreen Magnolias. 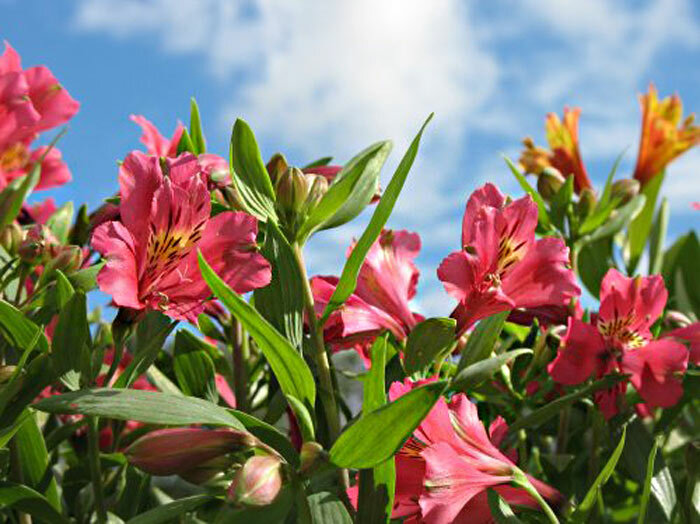 With the tropical weather we are currently experiencing, some plants we grow stand out as real winners proving to be tough, versatile and standing up to the hottest of conditions. 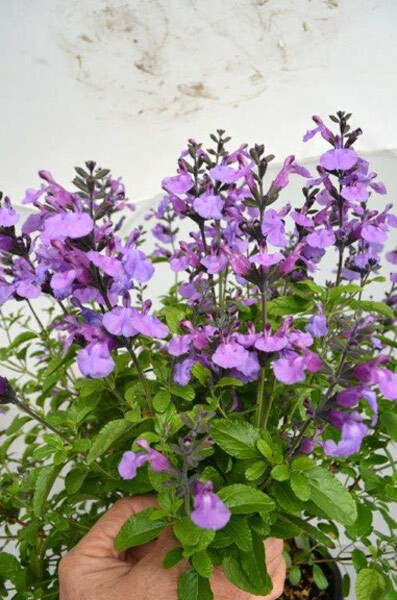 The Salvia ‘So Cool’ series are some of these. 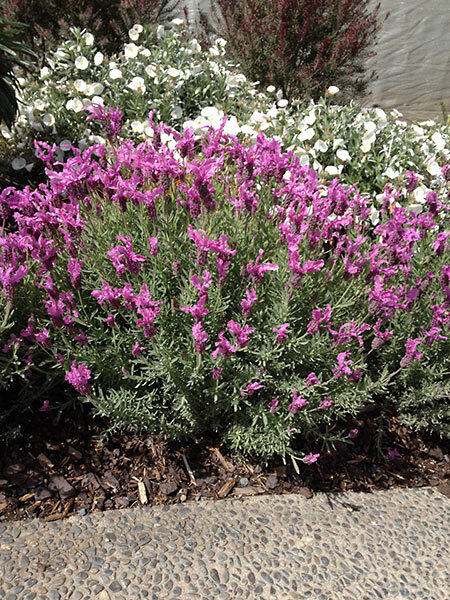 Bred in Australia to handle hot dry conditions these Saliva’s come in a range of ‘cool’ colours and are certainly very appealing massed planted in the garden. 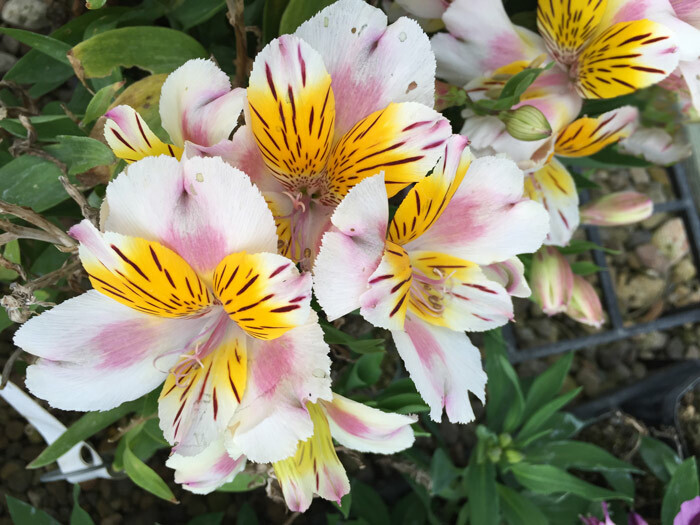 Growing Spectrums Saliva’s are looking stunning at the Nursery and are well worth considering as a plant to use for long lasting colour during the summer months. 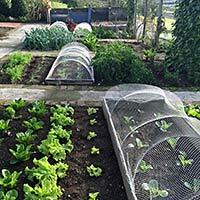 At Growing Spectrum preparation is well underway for that busy time of the year, Autumn. Our production teams have been busy potting new crops, and preparing space on the Nursery for the many thousands of plants we produce. 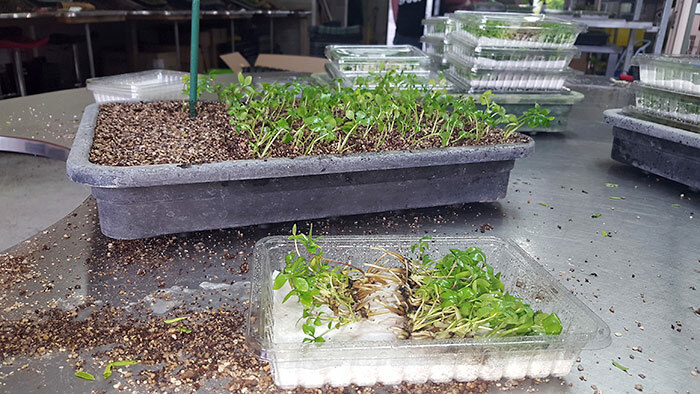 January and February are very busy months for our propagators who are preparing cuttings and planting tissue culture which will be our plants ready for sale 2018 and 2019. 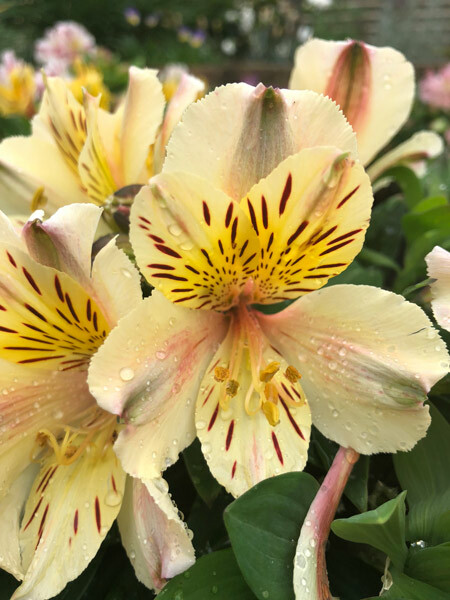 Commonly known as Peruvian Lilies our range of beautiful Alstroemerias at the Nursery are looking absolutely stunning and are proving to be a favourite for gardeners to plant at this time of the year. 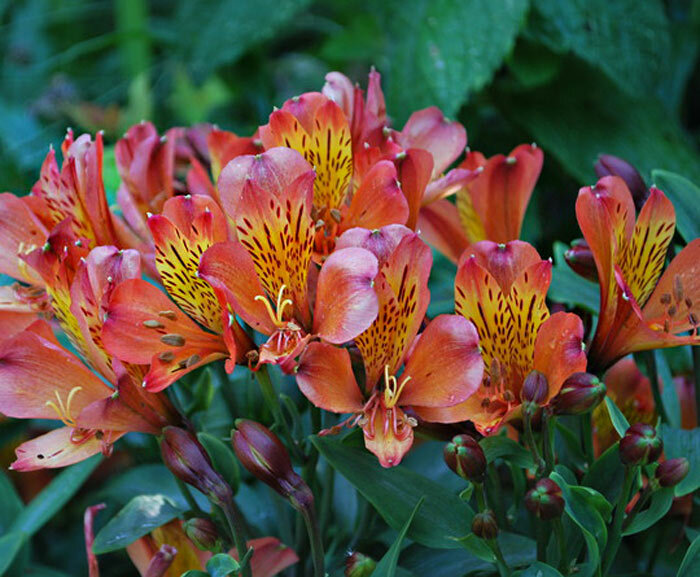 The range of Inca Alstroemerias we grow at Growing Spectrum are bred and selected by one of the world’s largest breeders in Holland. 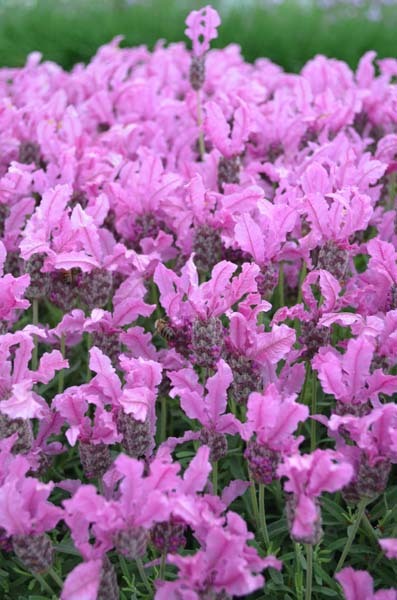 These fabulous perennials have a long lasting flowering period perfect for planting in the garden or in pots, and if used as a cut flower they will last for weeks in the vase. 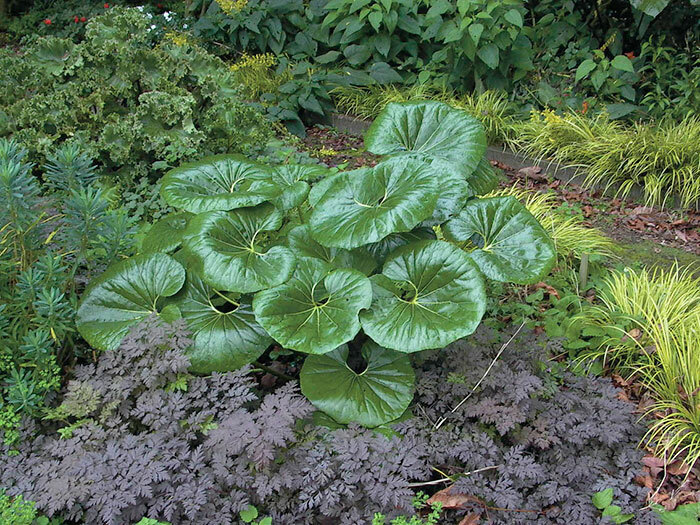 Growing Spectrum has been growing this outstanding large leafed, structural plant for the last couple of years. 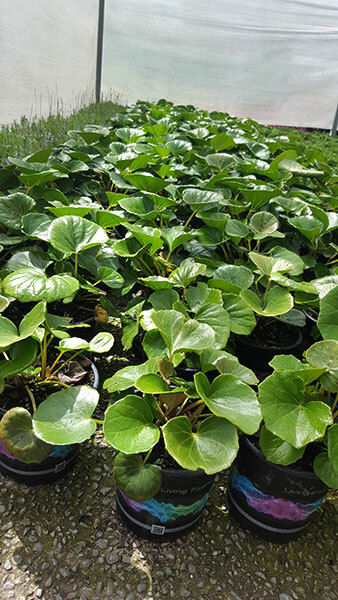 A distinctive clumping plant Ligularia reniformis produces glossy leaves which truly look like a tractor seat, a fantastic accent plant for woodland or shady areas of the garden. 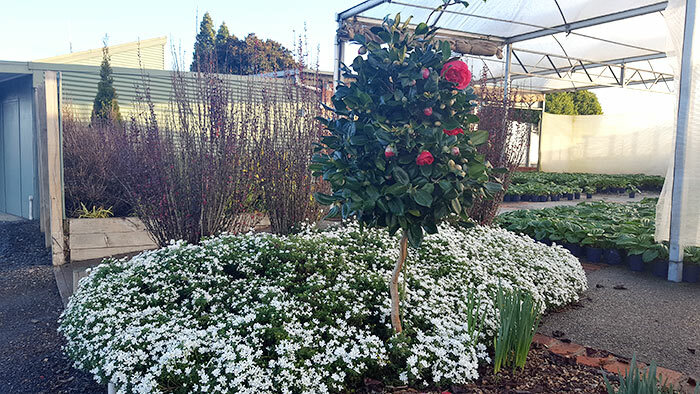 Our plants on the nursery look fabulous again this year and will be sent out to garden centres in the North Island this month. 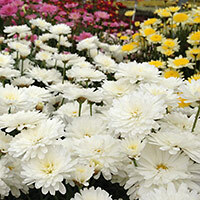 Our popular selection of pretty daisies are now being sent into Garden Centres for spring. 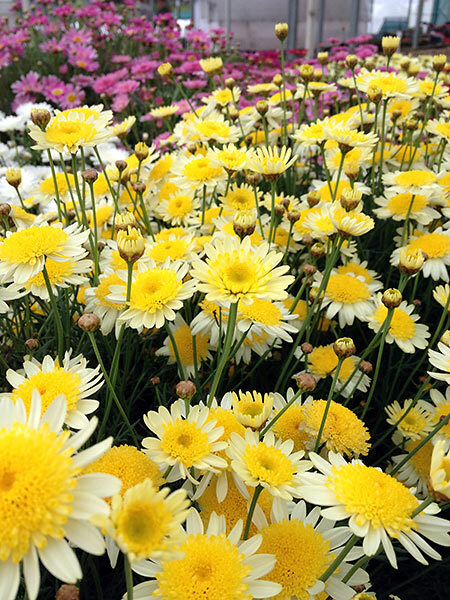 This new breeding of daisies are quick and very easy to grow, are great for filling in gaps in well-established gardens or planted with perennials, roses and annuals. 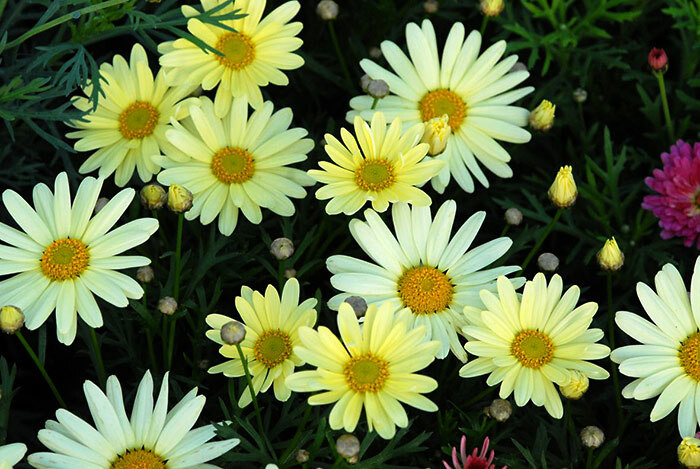 Plant them into virtually in any well drained soil in a sunny spot and they will flower for months. 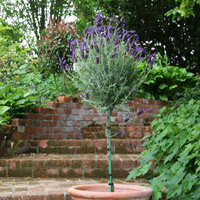 A little light pruning of the flower heads when finished encourages the plants to re-flower and become stronger growing. 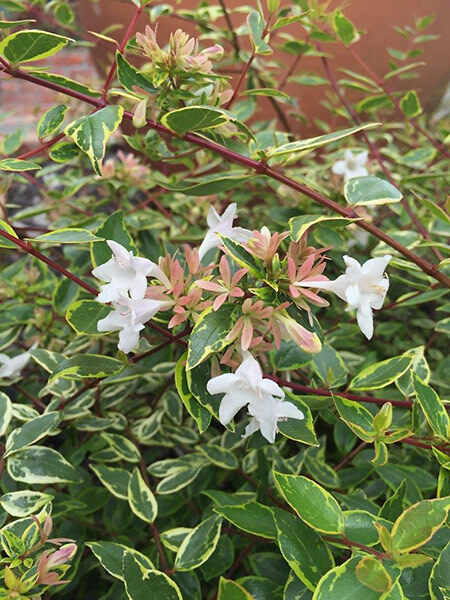 Over the last few years, these beautiful flowering shrubs have become a favourite with gardeners. Given the right position hydrangeas are easy to grow. 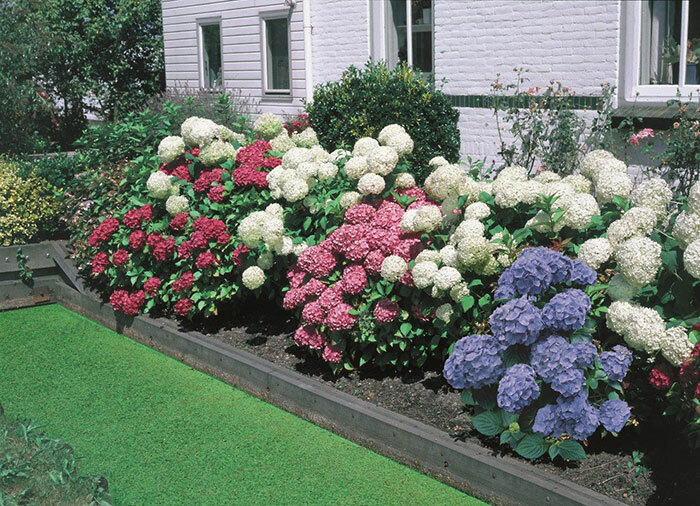 To maintain the colour it is as simple as applying the correct fertiliser, for pink hydrangeas add dolomite lime, blue hydrangeas aluminium sulphate, white require neutral soil. 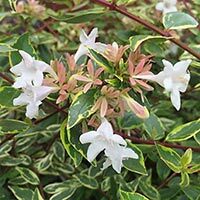 Although hardy and easy to grow they do require pruning by about a third late autumn through to midwinter, with most varieties rewarding gardeners with a display of beautiful flowers in early November. 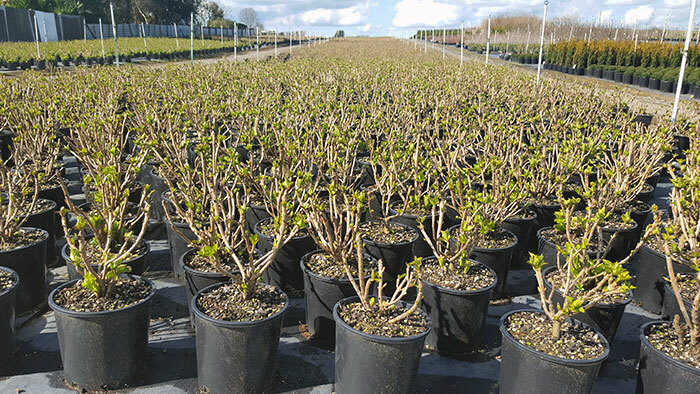 One of Growing Spectrums speciality crops are our lovely range of hydrangeas which are now ready to send out to garden centres for their spring sales. 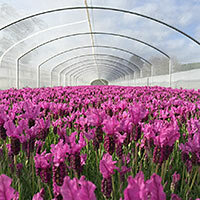 With the long-awaited signs of spring slowly appearing at the Nursery we are all gearing up for the busy period ahead. 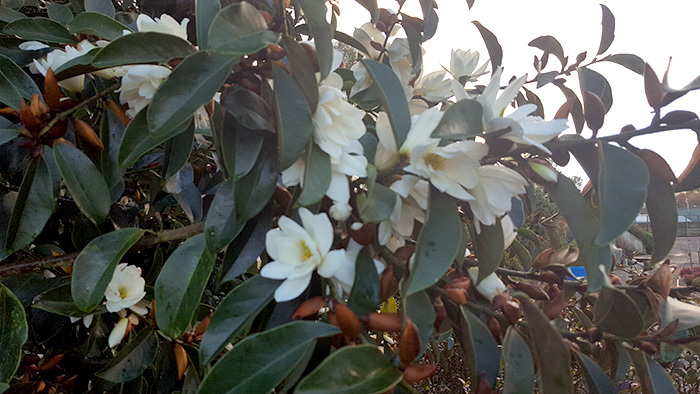 The early flowering evergreen Magnolia is truly beautiful with its lush green leaves and large scented white flowers, and there is nothing more delightful than seeing the odd clumps of daffodils starting to burst into flower. 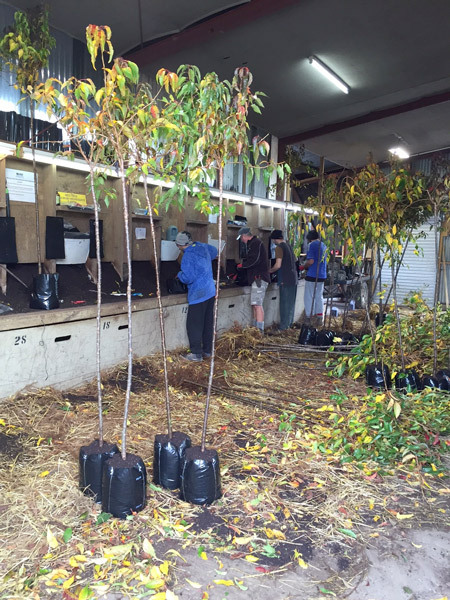 A busy couple of months ahead for Growing Spectrum as we begin to process hundreds of new seasons deciduous trees. 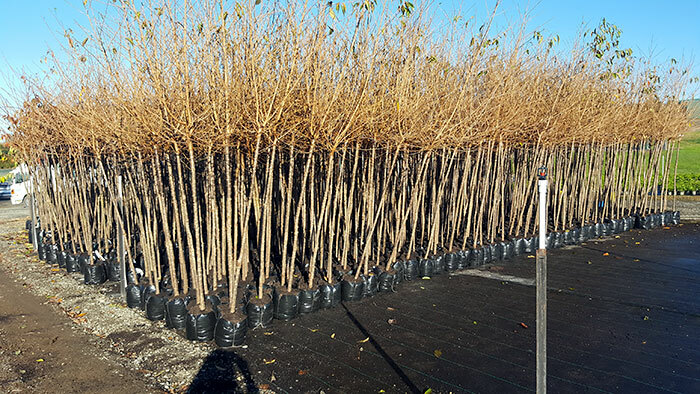 To ensure these trees are ready on time for Garden Centres to sell to their customers the processing of trees will be our full focus for the next six weeks. Early frosts and signs of an early winter are certainly evident at Growing Spectrum. 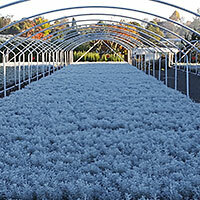 The Lavender Ghostly Princess crop, a new release for spring looks stunning covered with frost. Ghostly indeed! 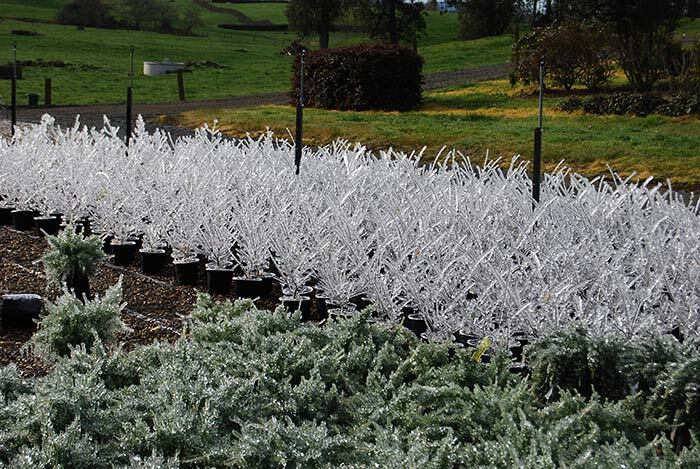 Our gallery photos show a peak of what Lavender Ghostly Princess will look like in flower this spring. 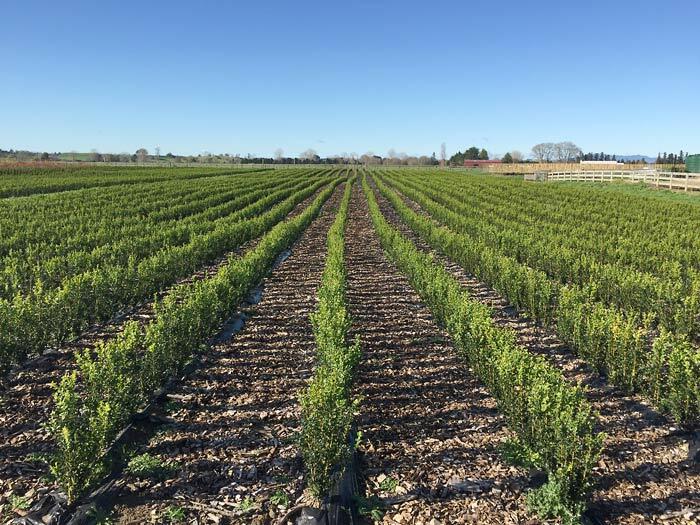 May is a busy time at our large nursery in Pirongia which produces Growing Spectrums extensive range of field grown deciduous trees and shrubs. 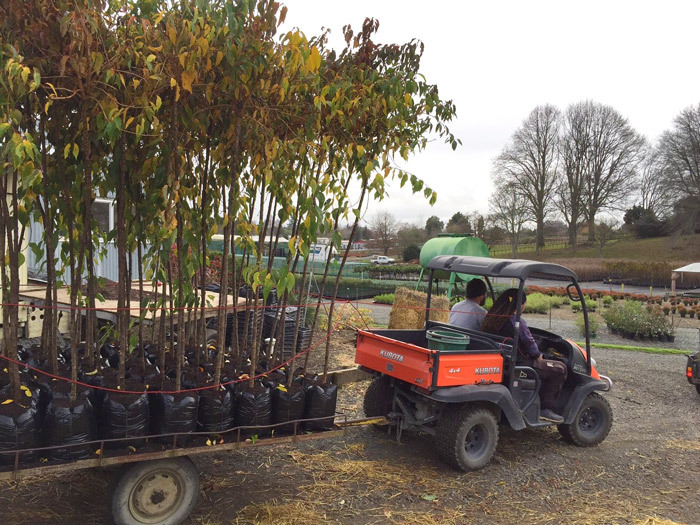 Work is well underway with the first process of lifting trees and shrubs from the field in preparation for our production nursery to start bagging and dispatching these plants to Garden Centres for retail sales. 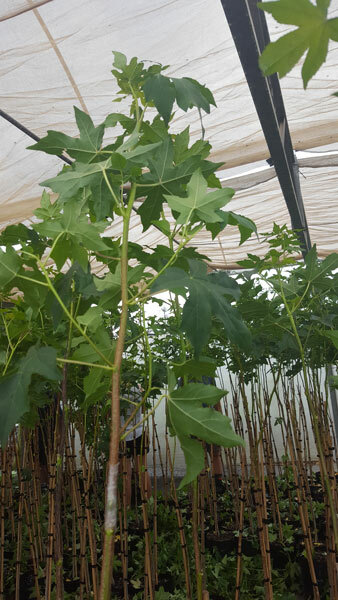 The first stage in processing field grown plants is to undercut the roots while they are still in the field. 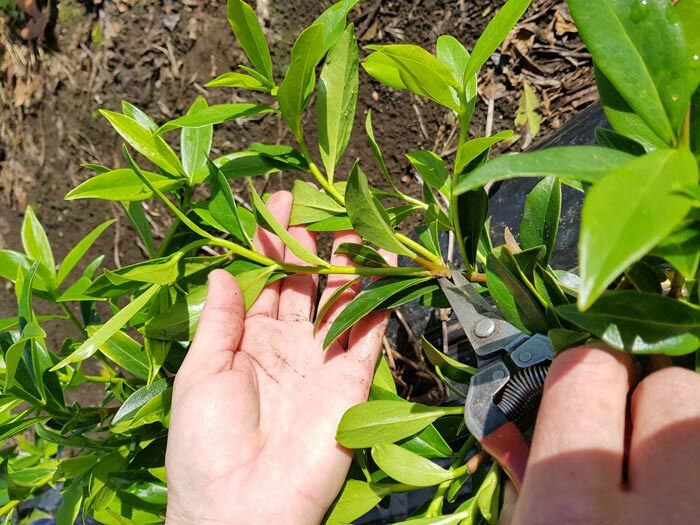 This involves cutting the taproot and any deep roots with a large blade which results in the plant forming a fibrous root system which then makes it easier for the plant to establish itself when replanted into the home garden. 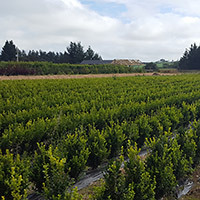 Our May photo gallery shows recent photos of plants which have been undercut and are resting in the field ready for processing which will take place in May and June. 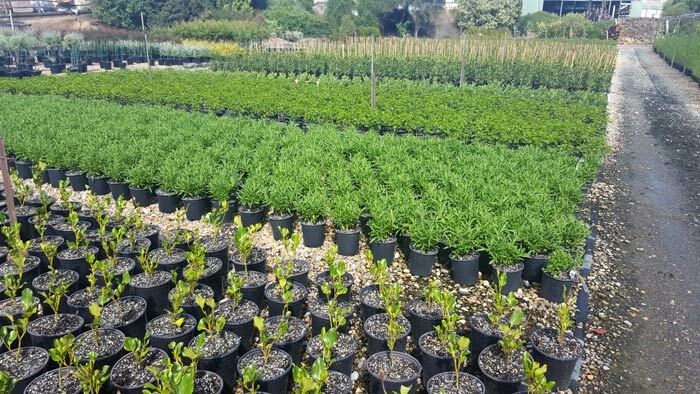 With the change of the season slowly creeping in, it brings with it fresh new crops on the nursery ready to send to garden centres for autumn sales. 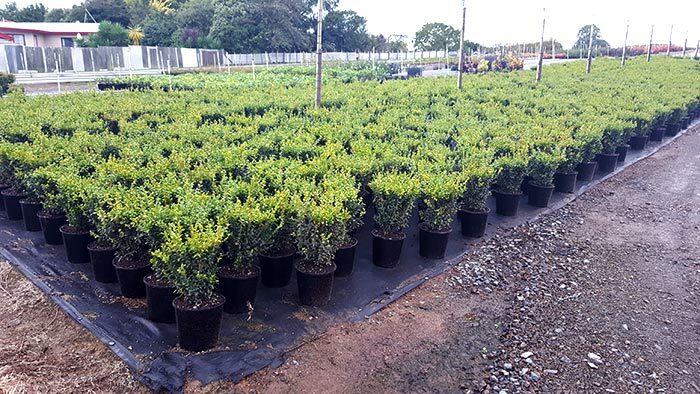 Currently our staff on the nursery have been busy processing the first of our open ground grown Buxus plants for 2017. 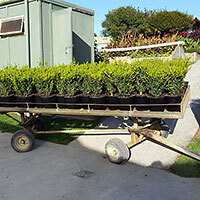 Buxus are a favourite plant with gardeners for use in the garden as a topiary specimen or as a hedge. 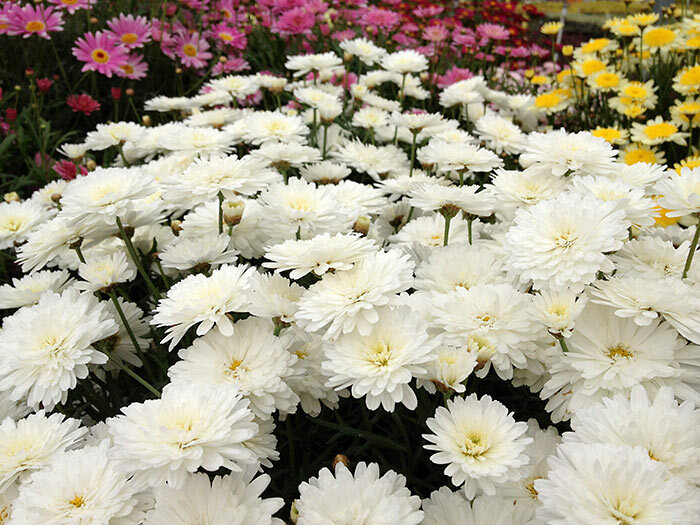 They are one of Growing Spectrum's crops which have a long production cycle. 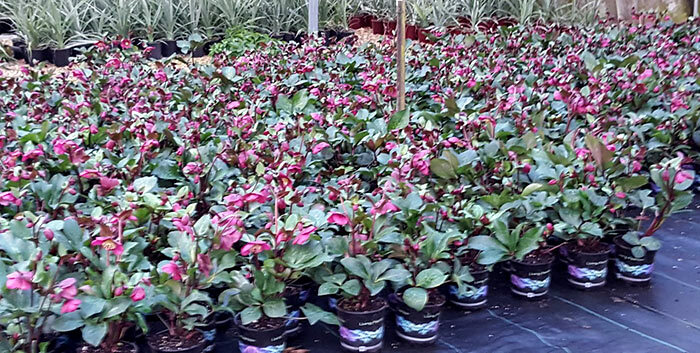 From the initial stage of taking cuttings to the finished product ready for sale it takes four years, a special plant indeed. 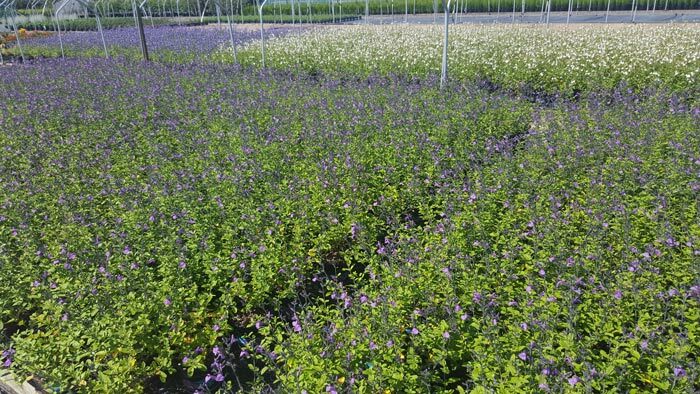 With autumn rapidly approaching we are well underway with production of not only our spring plants for 2017 but planning our 2018 crop production. 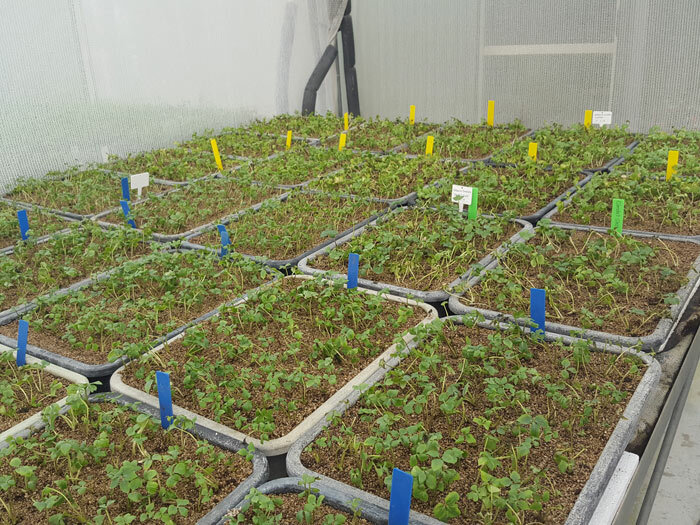 At Growing Spectrum our Propagation Team have been working hard to process the thousands of minute plants that come to us as tissue culture plants at this time of year. 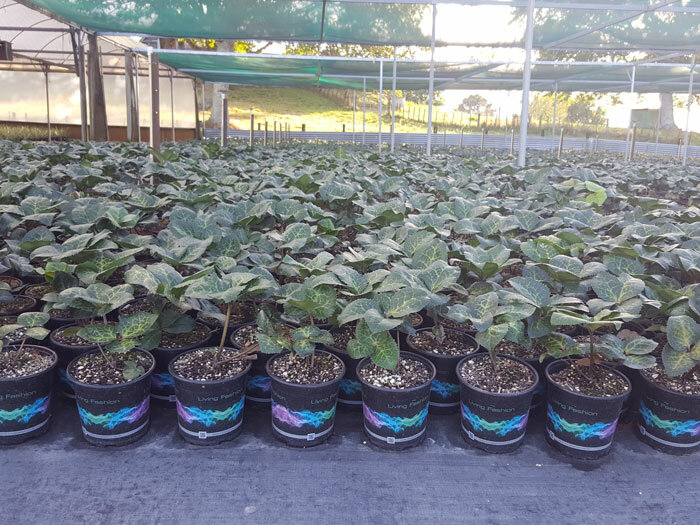 When these plants are ready they are sent to growers who carefully process them through various stages of production until they are ready for sale. 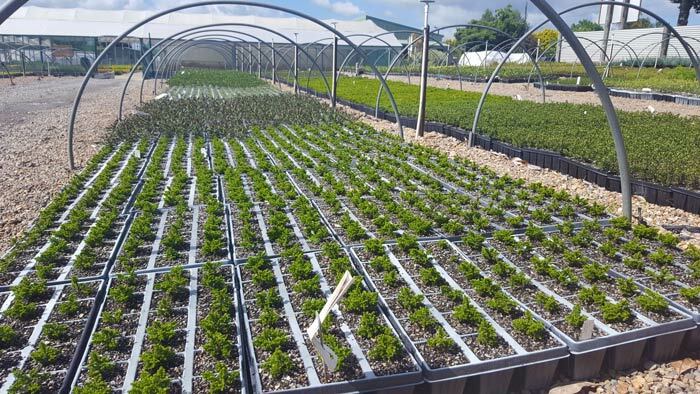 This process that can take up two years to produce beautiful plants ready for us to supply into garden centres and then into your garden! 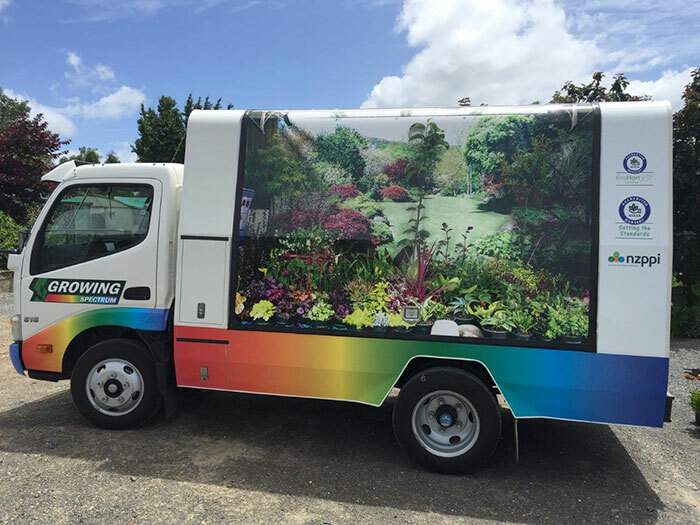 Growing Spectrums sales vans have had a fabulous new make-over featuring many of the plants we grow. Our vans have certainly been noticed and admired by other road users and what a pleasant view if stuck on the motorways. 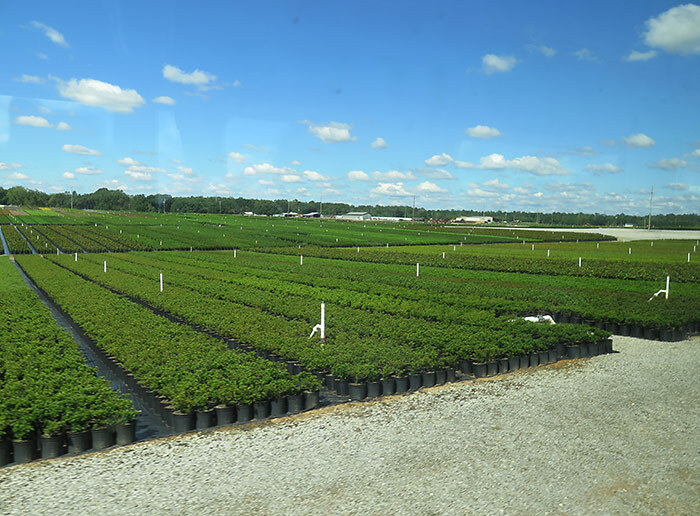 The production of plants never stops at Growing Spectrum and for the next few months, we are potting thousands of plants in preparation for next spring. 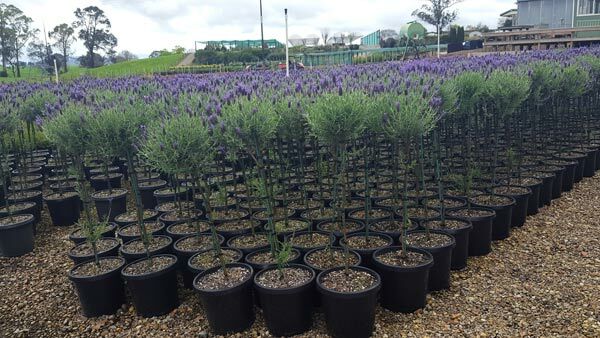 Our popular Lavenders, a favourite with gardeners during spring are well underway. Growing Spectrum was the first in the world to release this little 'Sweetie'. 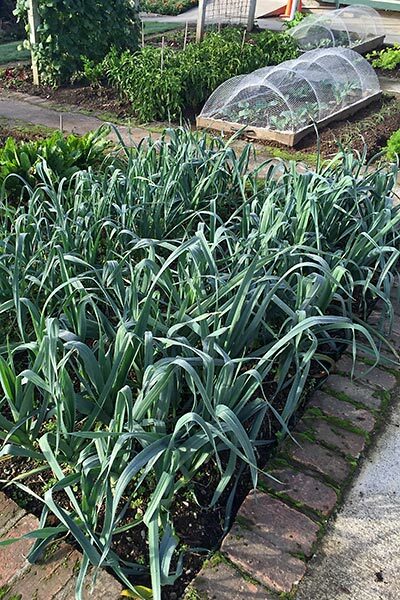 What a stunning crop we have growing in the nursery. 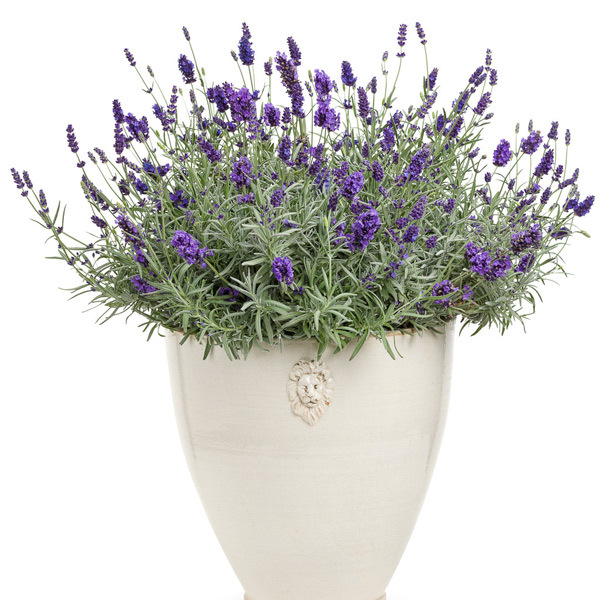 Plants are smothered with delicate lavender, mauve flowers which lighten as the flowers mature; one of our spring plants that are sure to impress any gardener. 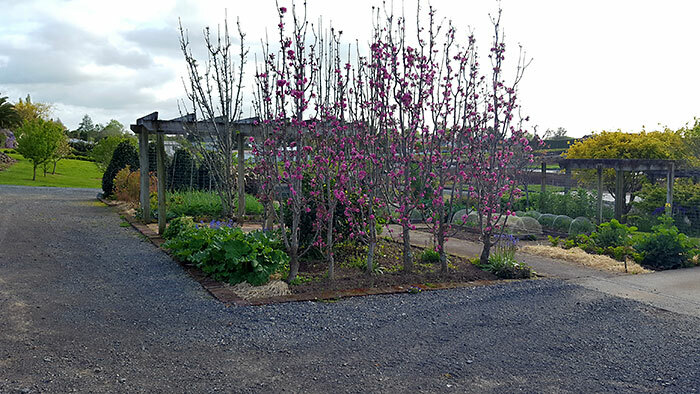 Our spring veggie gardens at the nursery are well on the way. 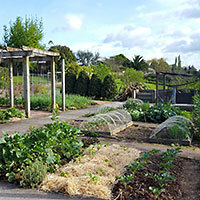 These gardens are tended by Bev who comes in weekly and does a fabulous job of growing vegetables for the staff. 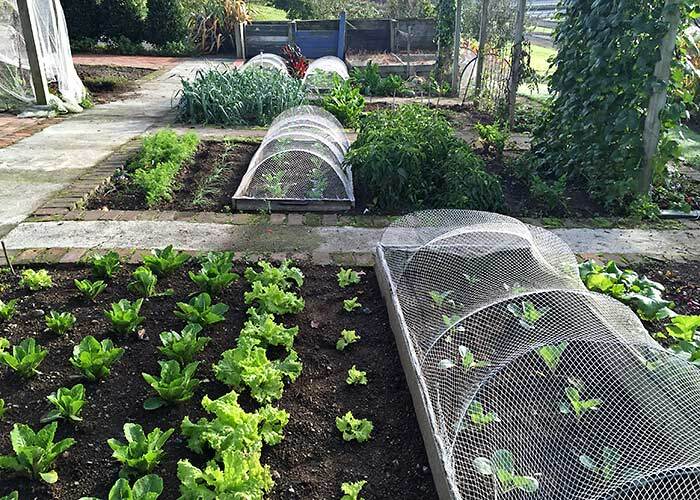 The range of vegetables Bev grows are not only interesting but extensive; veggies like garlic, lettuce, kale, broad beans, broccoli, strawberries, silverbeet and many more. The veggies Bev grows are harvested weekly and shared amongst our staff on Friday. Fresh is always best! During the winter Bev makes big pots of vegetable soup for the staff on those cold frosty days. Yum!! 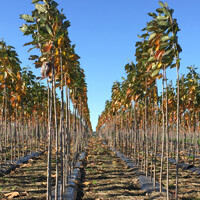 One of Growing Spectrums speciality crops produced are Standards and Topiaries. 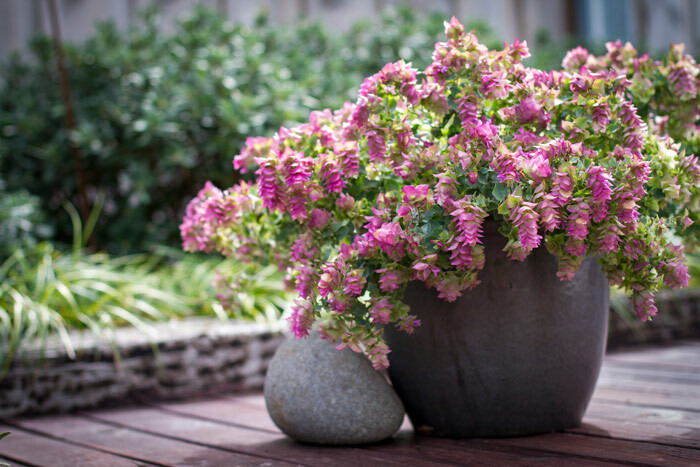 As we see the size of sections reduced in many of our cities and towns, these stately plants fit perfectly used as container specimen or border plants. 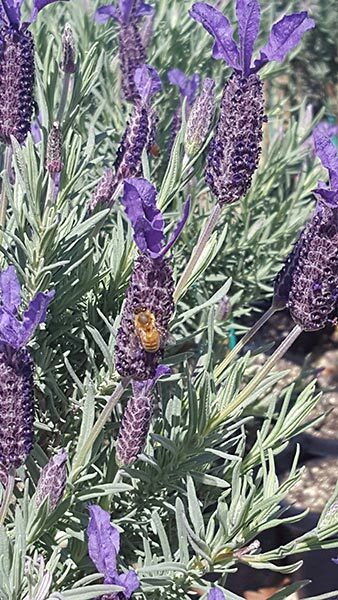 We have fabulous crops of Lavender standards this year, and a perfect plant to encourage Bees into the Garden. 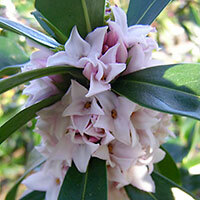 Daphne 'Perfume Princess' dubbed the Holy Grail of Horticulture by Don Burk on A Current Affair. Growing Spectrum's most popular lavender, 'The Princess Lavender'. 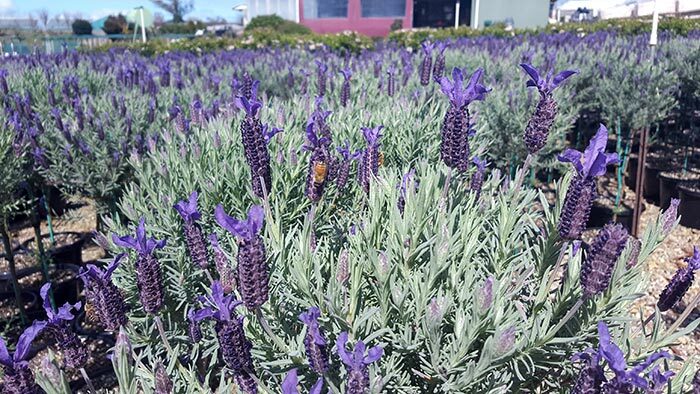 With the warm extended autumn and warmer than usual winter temperatures, we have some gorgeous crops of The Princess Lavender this year. 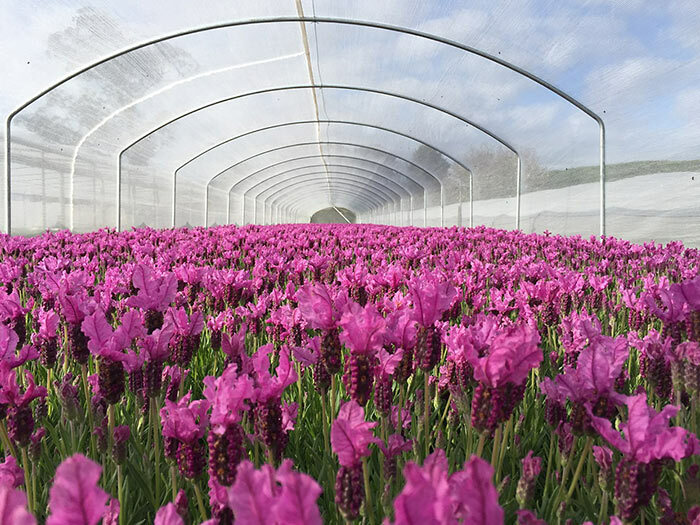 Our plants have been kept undercover away from any frosts which can damage the flowers and are now being dispatched out to retailers, ready for the much anticipated spring sales. 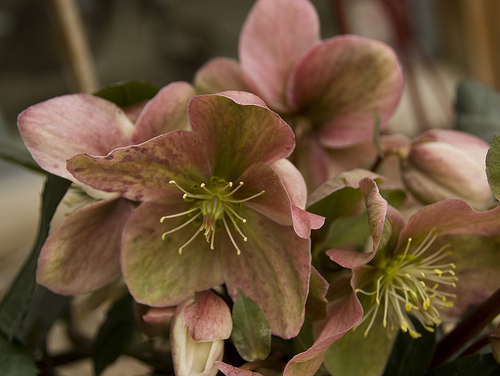 The last crops of Hellebores are ready for dispatch and will be sent to garden centres over the next two weeks. These wonderful winter and early spring flowering perennials are a stunning plant for a semi shaded spot in the garden. 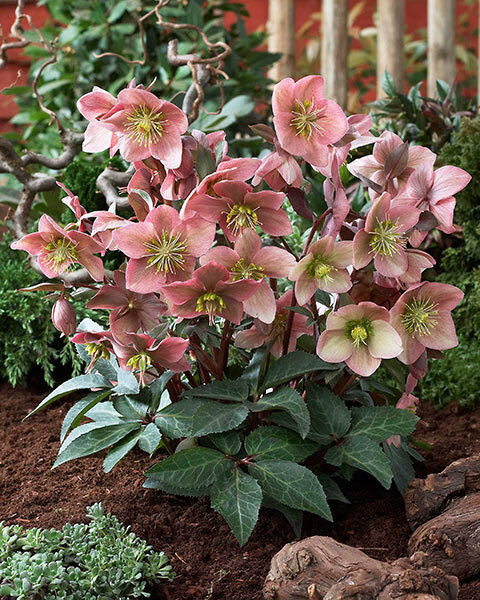 Hellebores are easy to grow and care for, with colours ranging from white and pinks to deep purple and reds. At this time of the year we are busy, busy, busy. (When are we ever not?) 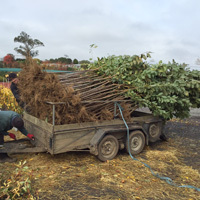 But we are particularly busy at the moment lifting all of our field grown trees from our open ground nursery, to get them potted to send into garden centres while they are in their winter dormancy. 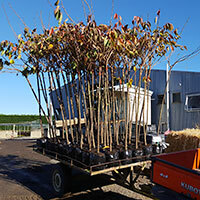 It is a huge job digging all the trees and then potting them up, labelling them and delivering them. 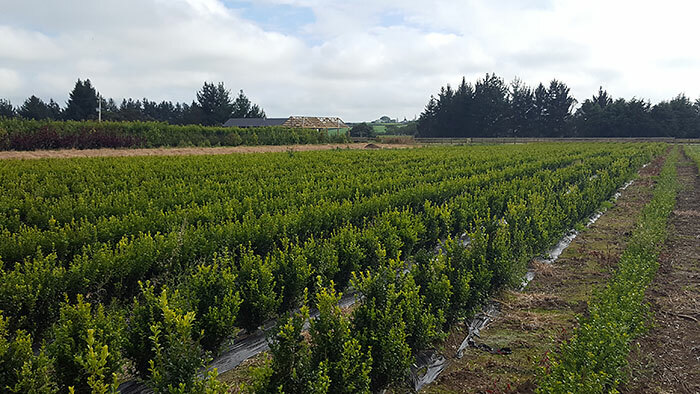 This year’s stock is better than it’s ever been, coming out of our new nursery block. 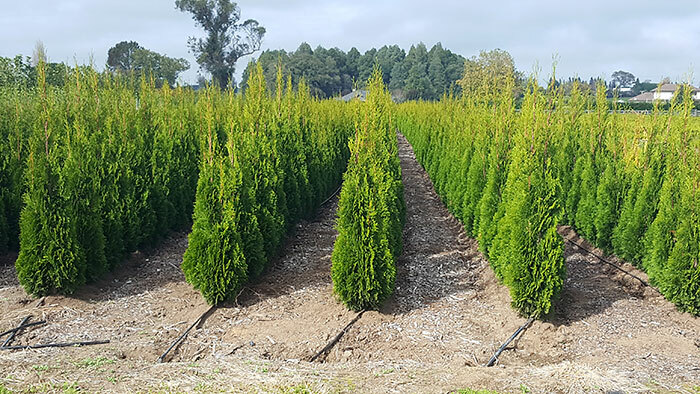 If you are looking for trees for your garden now is the time to get into your local garden centre to make your selections. 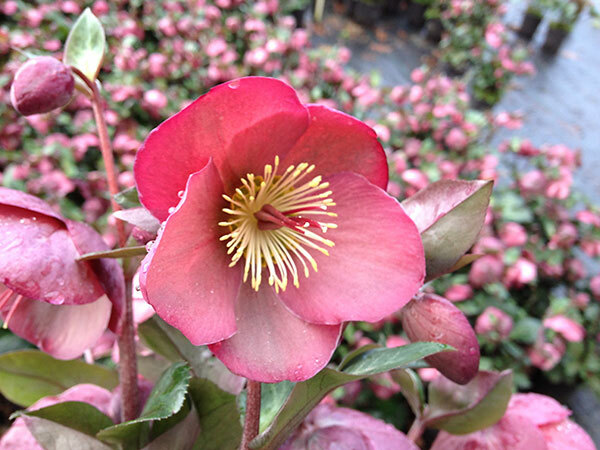 The new named varieties of Hellebore are stunning! 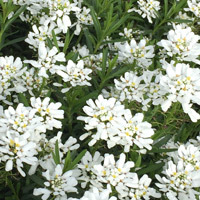 ‘Winter Sunshine’ is very good flowering form with pink, flushed white flowers through the late winter, with the flowers fading to red in early spring. 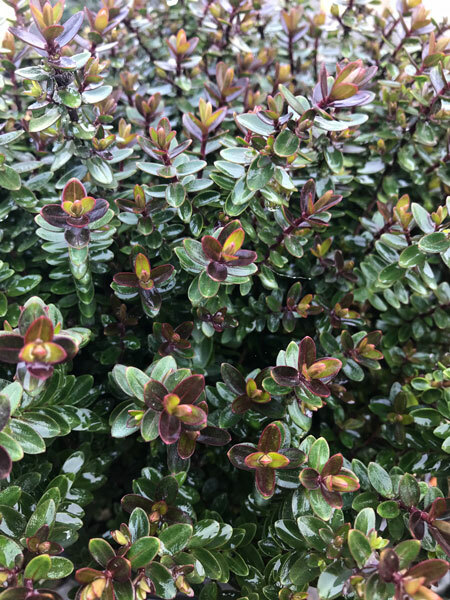 Deep steel grey foliage on a compact form. 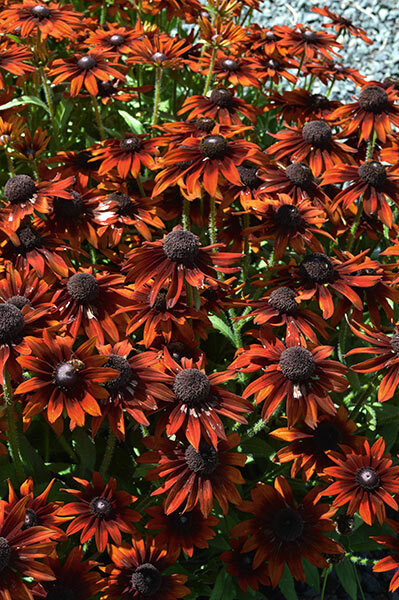 Best planted in a shaded, cool position in the garden for flowers through July and August. Also look in stores this winter for ‘Anna’s Red’, ‘Penny’s Pink’, Tutu’, and ‘Ruby Glow’. Yep that’s a pun, of course we’re growing, that’s what we do! 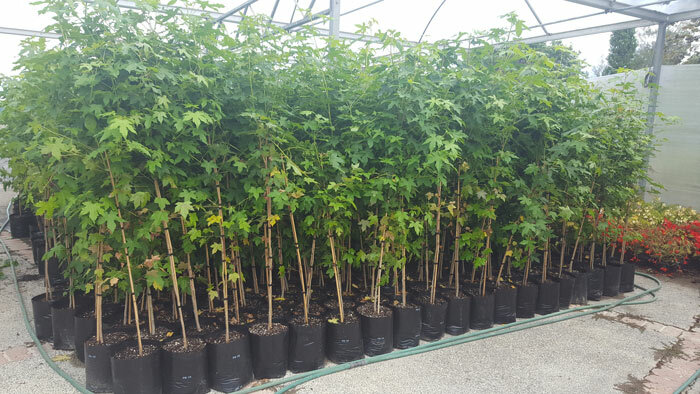 We grow lots and lots of plants and our business continues to grow larger as we accommodate our ever increasing range of plants. 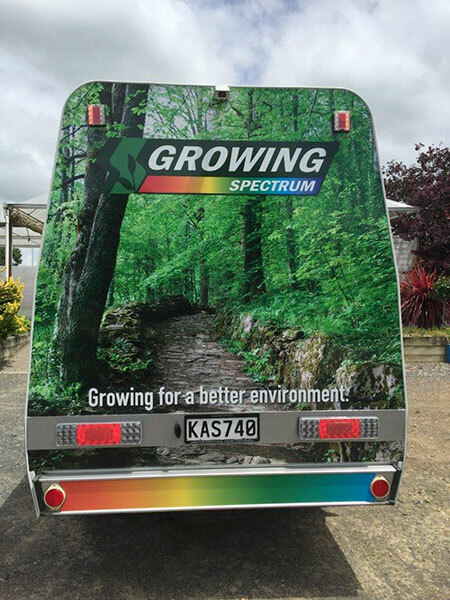 Growing Spectrum is a leading wholesale nursery in the New Zealand industry and we work really hard at growing a great range of product and at the very best quality. 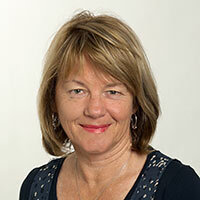 As part of our continued growth we have welcomed Julie Gregory to our team of staff this month. Julie has been part of our industry for many years and comes to us with a wealth of knowledge of plants and retailing and will be assisting us in stepping up to the next level. 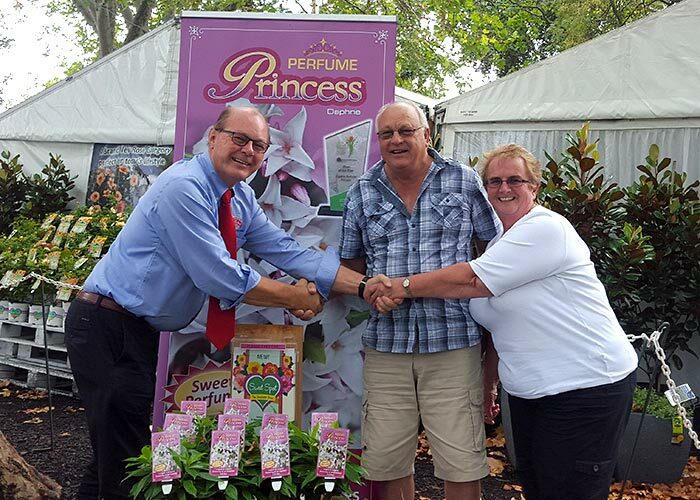 Mr and Mrs Harness won a return trip to Melbourne Flower Show in mid March. The competition was for anyone who purchased the new ‘Sunset’ rose when it was released in 2015. 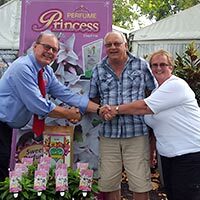 They were greeted at the flower show by Mr Anthony Tesselaar, the international marketer of the Flower Carpet Rose series. Check out our brand new release - Abelia 'Sunshine Daydream'. 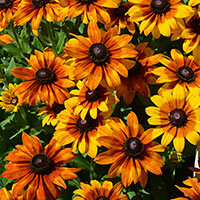 Check out these delightful new Rudbeckias - 'Sunflare', 'Sunshine' and 'Twilight'. As we head into a new year we are starting to recruit new staff. Do you have what it takes to come and work in one of the country’s leading nurseries? 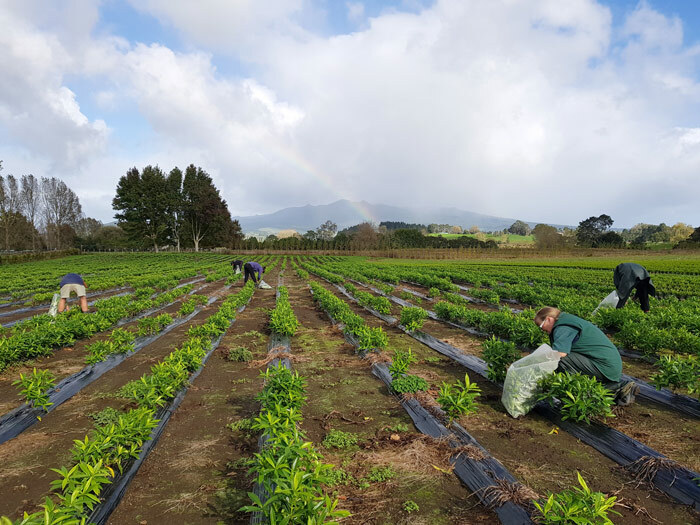 Toward the end of 2015 a couple of our staff decided that they needed to make a change, heading overseas or back into tertiary education, so we are currently looking for a couple of passionate people, passionate about plants that is! 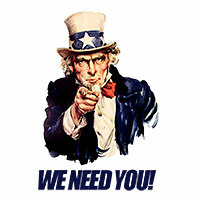 Early in the New Year we will have a couple of positions available in our despatching department. This is a team of young energetic staff who travel around the nursery on quad bikes collecting the plants that are going out on orders, they detail and label all the plants and load them onto trollies for delivery to stores. It is fast paced work, requiring accuracy and high standards. If you’re looking for a challenge and think this may be of interest give Grant the Manager a call! We are almost past the madness of Spring and heading toward the heat of summer, and summer holidays. 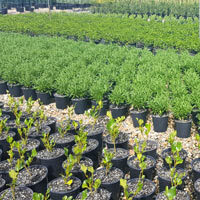 In the nursery we are working hard to get our stock potted before Christmas which will be on sale next spring. 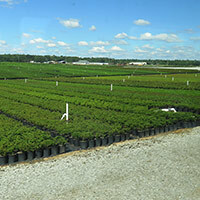 It’s a long way to plan in advance to get a plant ready for sale! The nursery ‘closes down’ for a couple of weeks over Christmas and the New Year so that our sales and freighting departments can get a break, we will all be back at work on the 5th of January, ready for a new year. 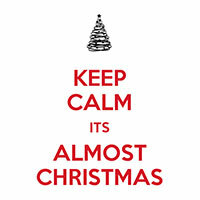 If you are heading away for a holiday, have a relaxing time with family and friends to re-charge for the year ahead. 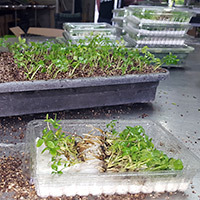 The owners of Growing Spectrum, Peter and Carol Fraser have just returned from a trip to America where they attended an International Plant Propagators Society Conference and toured around many nurseries in the California and Florida regions. The purpose of these trips is to learn! Nurseries around the world are always very good at sharing information and we love to welcome other nursery people into our businesses to share information and hopefully learn something new. Indeed the philosophy of the IPPS is to ‘seek and share’, a very admirable business philosophy. 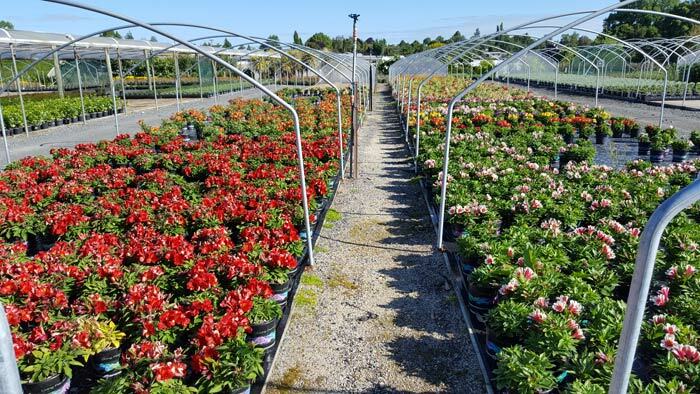 American nurseries are of course much larger than those in New Zealand and cover vast areas of land, growing millions of plants for the American market. But there’s always something that can be learnt! POLYGALA ‘LITTLE BIBI’ is released in New Zealand for the first time this month. 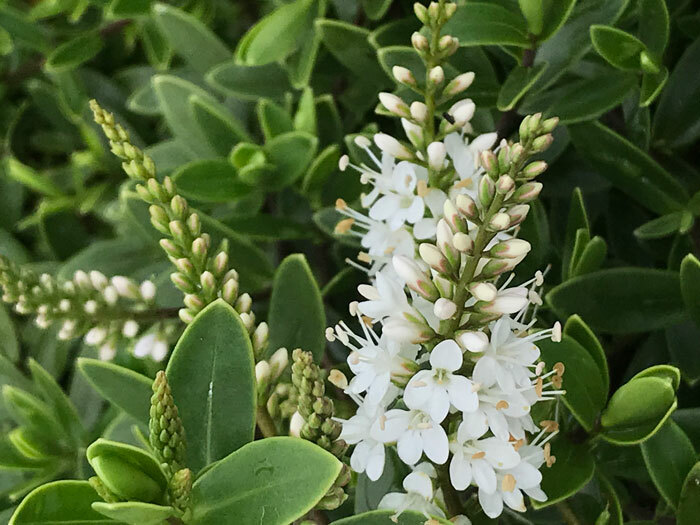 A wonderful small shrub which just seems to flower continuously and never needs trimming or spraying! Try it, you won’t be disappointed. 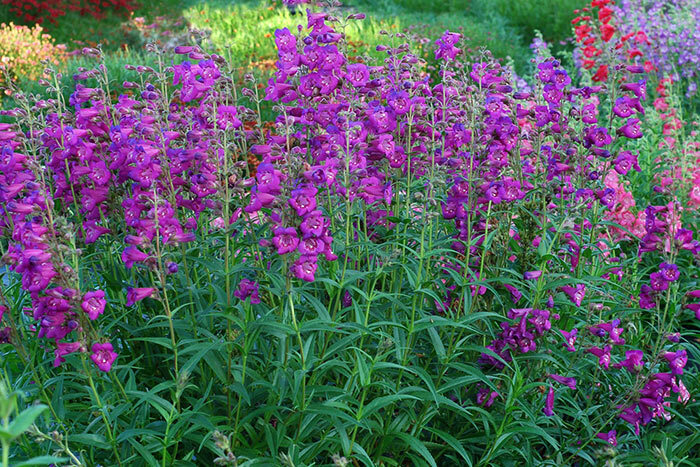 PENSTEMON CHACHA ‘HOT PINK’ and CHACHA ‘PURPLE’. 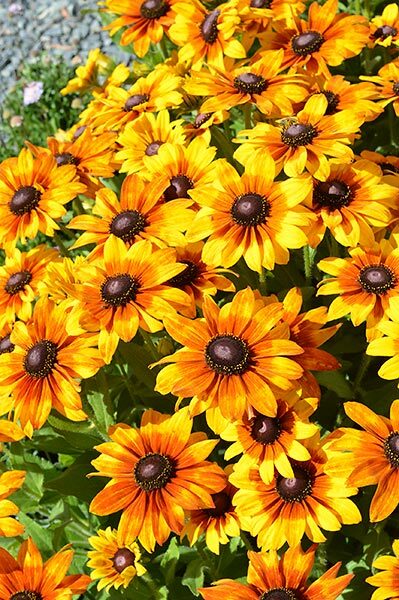 These wonderful perennial plants have been around for what seems like forever, the sort of plant our grandmothers always had in their gardens as they are so good for picking flowers through the summer months. Now we have some newly bred colours available. 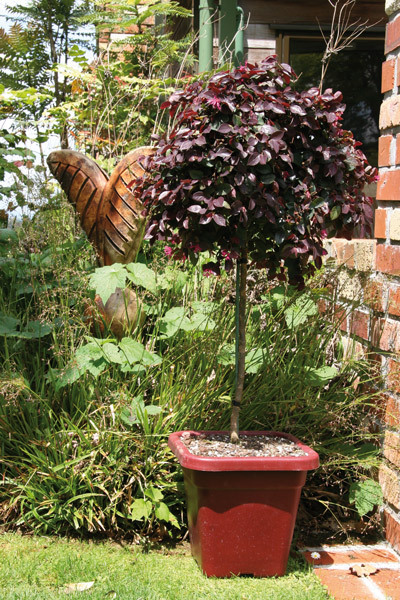 Check out the CHACHA SERIES which will be in garden centres in the coming weeks. One of our propagation team, Kim Wood, was very lucky to be selected to travel to Japan this month as a guest of the Japanese Plant Propagators Society. 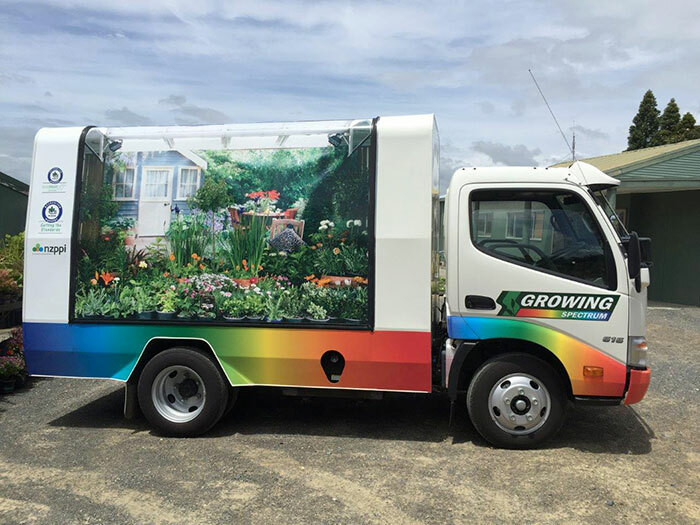 Kim has travelled extensively around Japan visiting nurseries, Tissue Culture Laboratories, Garden Centres and related businesses. We are looking forward to Kim’s return and seeing the photos of her travels and seeing if there are opportunities for us to use here at Growing Spectrum. 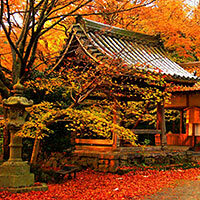 It is Autumn in Japan at the moment. She will have to come back to New Zealand to see the cherries in flower! We will put up a news report here at a later date. 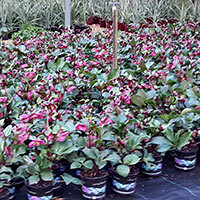 Spring is here and the nursery is rapidly emptying as we send product into the garden centres. A couple of fine weekends and gardeners are getting busy tidying up and re planting for the summer ahead. 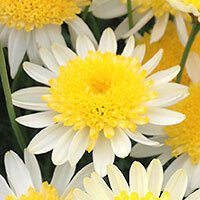 A couple of exciting new plants that are being released this month to add to the Federation Daisy Range. ‘Honeycomb’ is brilliant yellow with a lovely double centre. 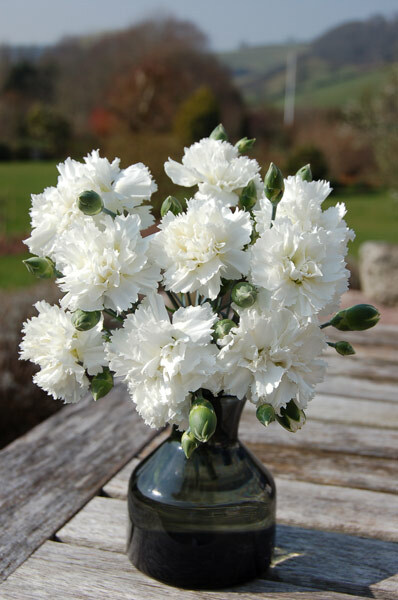 ‘Purity’ is of course pure white and will make a wonderful display. 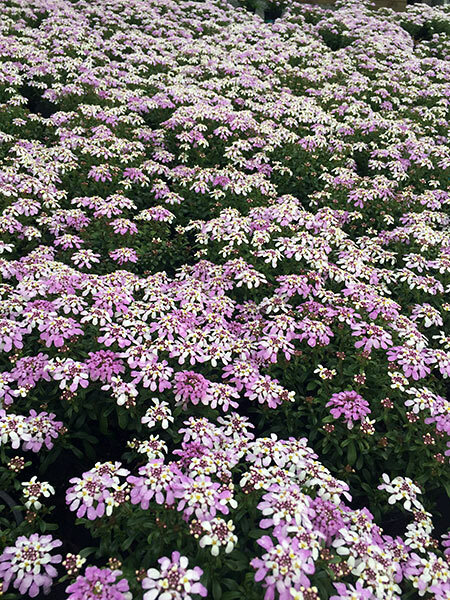 ‘Superstar’ is brilliant pink with splashes of white and a yellow centre, all three new varieties are proven to be great garden plants and will make a wonderful summer display. Available in garden centres this month. 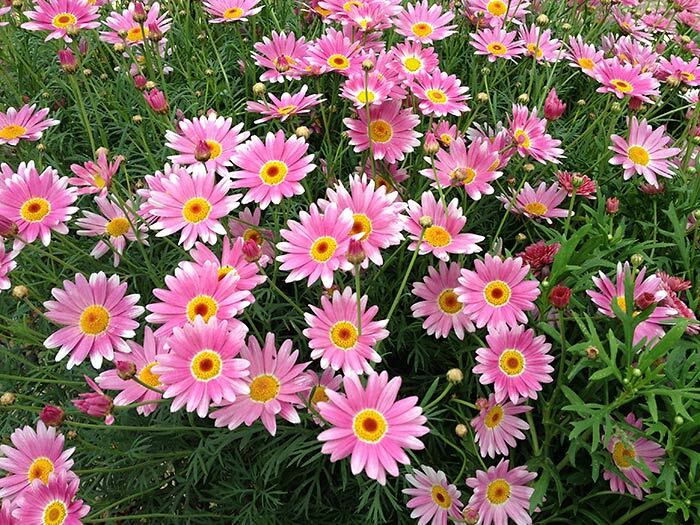 There’s nothing quite like a daisy for mass colour in the garden through the summer months! The most dramatic change between seasons is the move from winter into spring. The trees have been bare for the past few months and suddenly erupt into blossom then leaf. 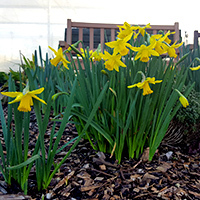 The spring bulbs push their way through the ground and is seems like there are brilliant yellow daffodils everywhere! 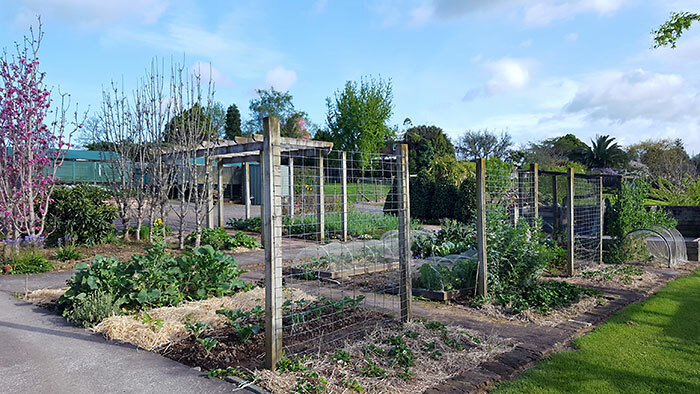 Around Te Awamutu the local council of years gone by planted many hundreds of daffodils in many of the parks and reserves and along road sides, a wonderful legacy for future generations. They are an amazing site as you drive through the town in spring. 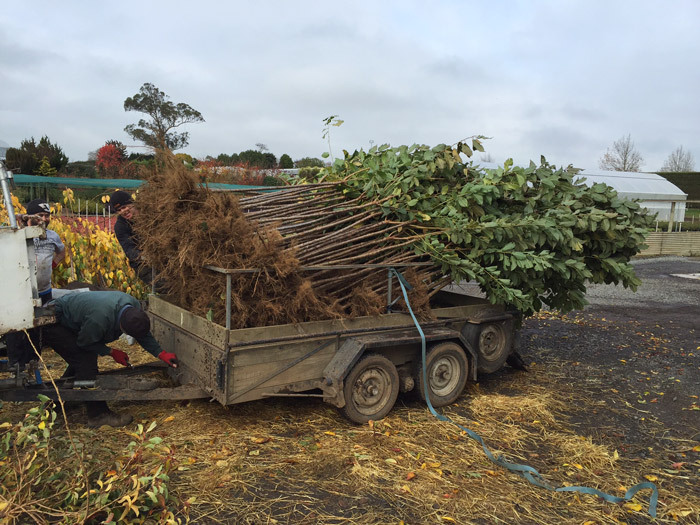 Sadly the large Prunus ‘Awanui’ which were planted down the main street of the town are now being removed as they have grown too large. Thankfully many more flowering trees have planted in more suitable situations around the towns parks. At this time of the year when most nurseries are fairly quiet, waiting for the spring trading to start, at Growing Spectrum we are really busy sending trees and open ground grown shrubs into stores. 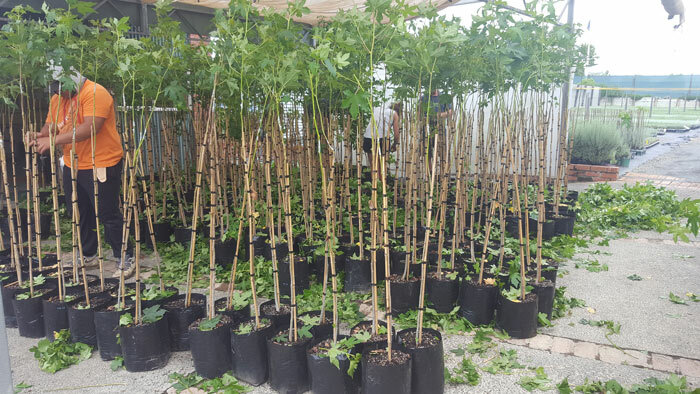 It is really hard work for our staff digging and potting tens of thousands of trees and shrubs, then labelling and transporting them out to stores. Luckily we have a great team of staff who get stuck in and get the job done. We occasionally freeze over here in the Waikato. 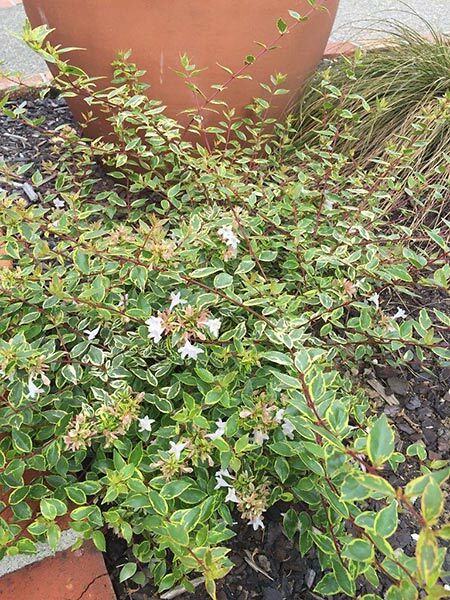 Many of our plants are kept under cover for the winter to avoid frost damage but there are some very large crops like our beautiful COPROSMA that take up far too much space to be able to cover. 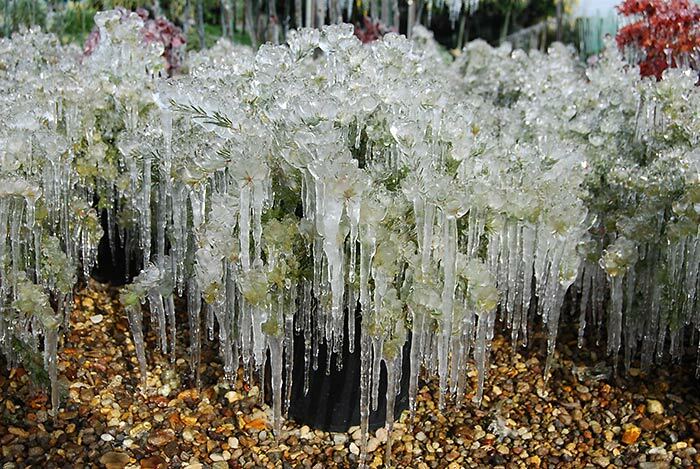 So we put them under what we call ‘frost protection sprinklers’. 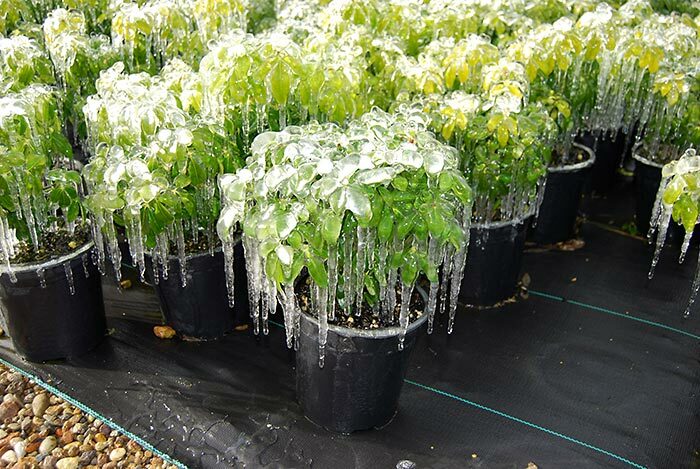 These special sprinklers emit a very fine spray across the plants when the temperature drops down to 1 degree C. This puts a layer of water over the foliage then as the temperature continues to drop the ice forms over the water forming a very thin insulation layer between the foliage and the ice, protecting the cells in the leaf. Clever! 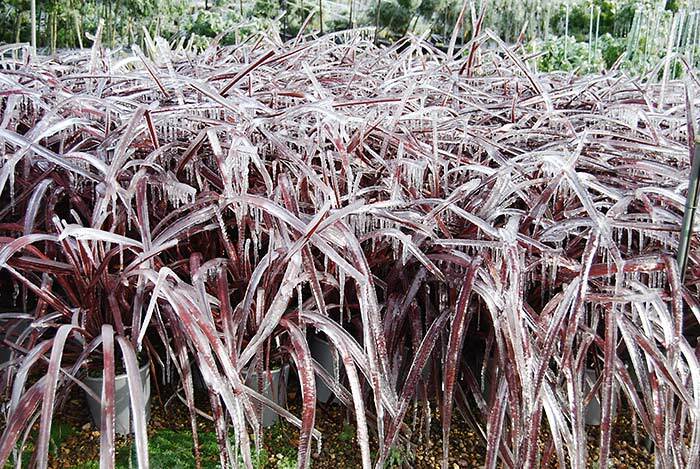 The ice builds up through the frosty morning and we get some amazing scenes in the nursery of ice covered plants. 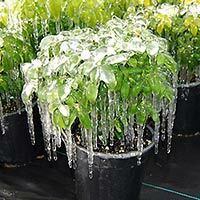 The ice falls off the plants as soon as the sun comes through and the plants are undamaged. 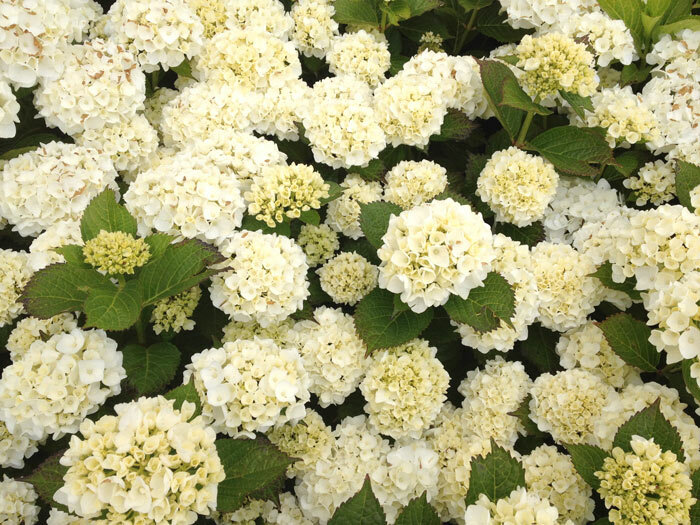 If you want to get the best flowering from your HYDRANGEA there are a few simple rules to follow. Hydrangeas flower on the branches from the previous year and do best if pruned every winter. 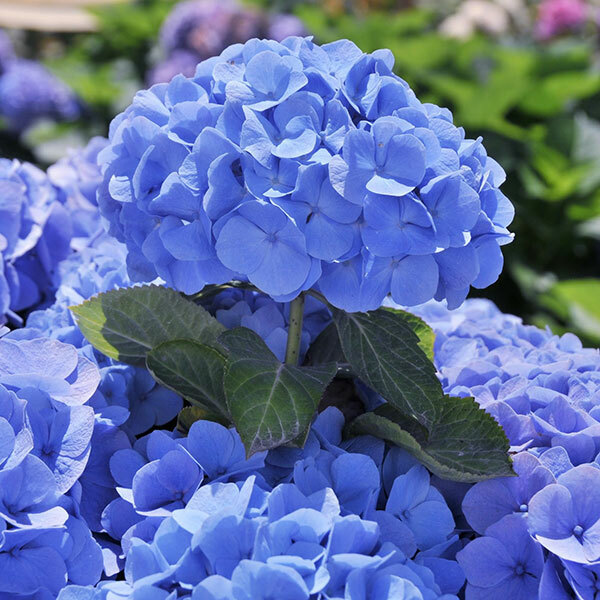 If your Hydrangea has been neglected over the years and is growing all spindly and floppy, you might want to start the first year with a really hard prune back to about 50cm above the ground. 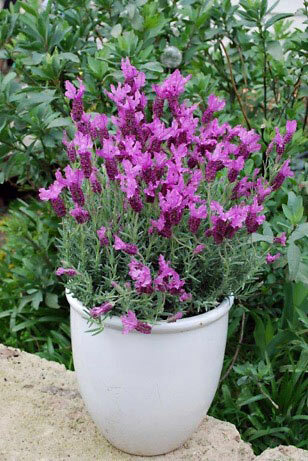 This will encourage your plant to put on lots of new growth, but it will hardly flower in the first year. In following years there will be plenty of flowers again. 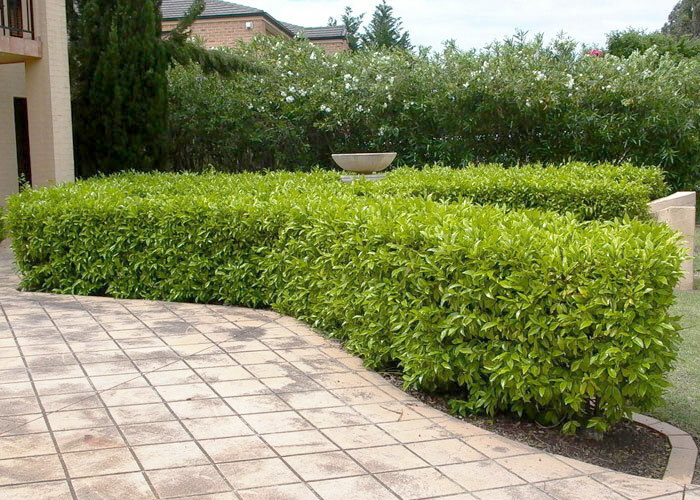 We know some people that do this process every 4 years, once the shrubs get out of hand. 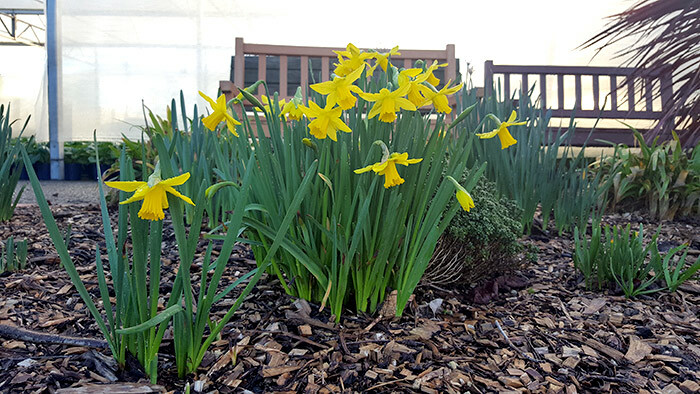 However, if you don't want to miss out on the flowers every fourth year and prefer to keep your plants generally tidy, then prune every winter by taking the second-year wood right down to the base of the plant. It is easy to tell the age of the wood. Usually the second-year wood is lighter in colour, more branched out at the top and has old flowers on it. By taking this out you provide more light within the plant so new shoots can develop from the base. Your plant will never get higher than what it can grow in two years. 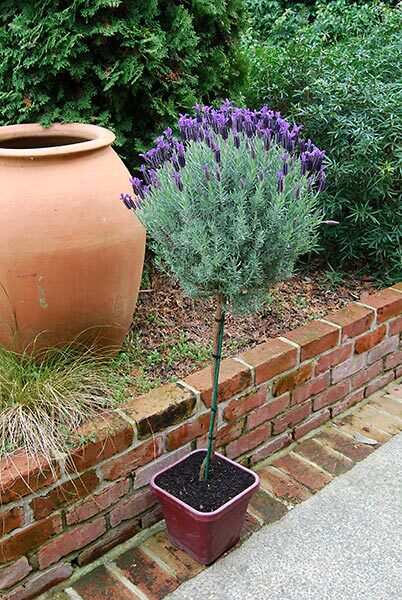 Do not prune back the one year old wood unless a branch is really sticking out of the general shape of the plant. 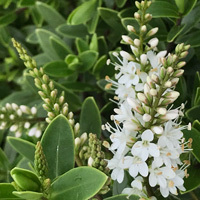 The early flowers are already sitting in the terminal buds of these branches and are followed by flowers on the little side branches that develop in spring. 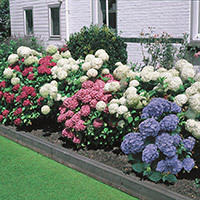 Different varieties of Hydrangeas grow to different heights in the two year shoots, ranging from 50 cm to 2.5 metres. 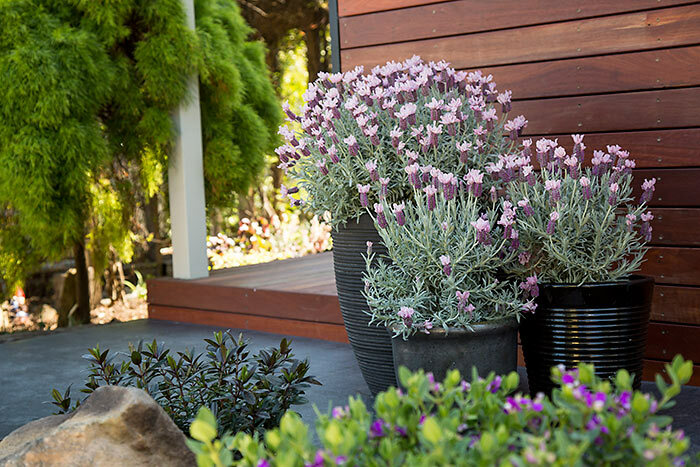 Make sure you choose the best variety for the garden situation. 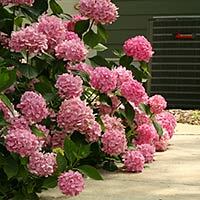 If you have to prune your Hydrangea constantly to keep it contained, you will have fewer flowers. Hydrangea paniculata (cone-shaped flowers) needs to be cut back to 5cm long stumps on all branches every year. Hydrangea quercifolia (oak-leafed) is grown mainly for its foliage and responds well to having the tips pruned. Climbing Hydrangeas don't have to be pruned unless they get out of hand. 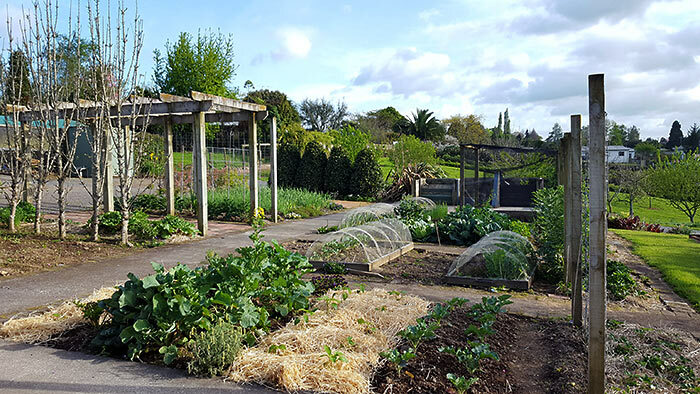 Our nursery includes many garden beds where we grow plants that we use for cutting material in order to grow the next batch of plants. 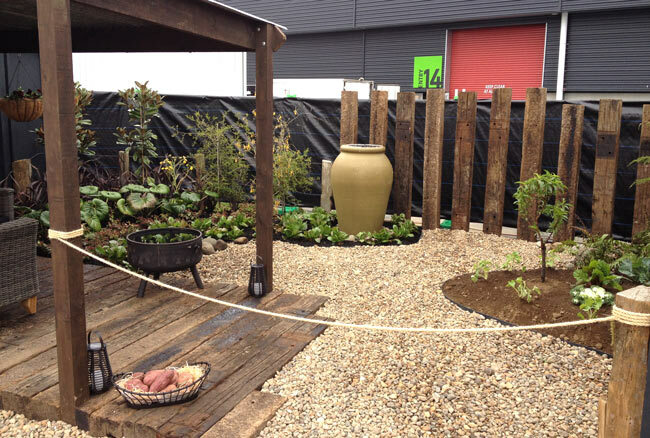 We also have a small area dedicated to growing lots of beautiful vegetables! 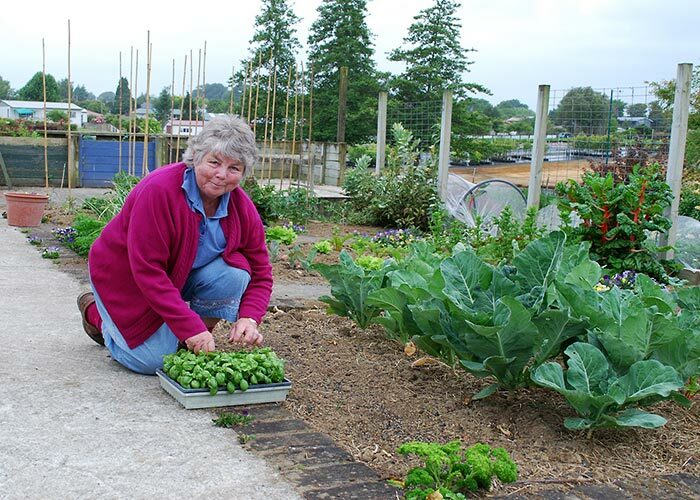 One of our retired staff comes into the nursery every week to maintain the garden and harvest what is ready. Wonderful Bev has a continual cycle of seasonal vegetables and it is amazing what is produced out of a small area. Every Friday morning all the staff meet for a weekly catch-up meeting and Bev produces a barrow of fresh vegetables to share. During the winter months Bev's vegetables go into big pots of soup to warm all our hardworking staff on the coldest of days. 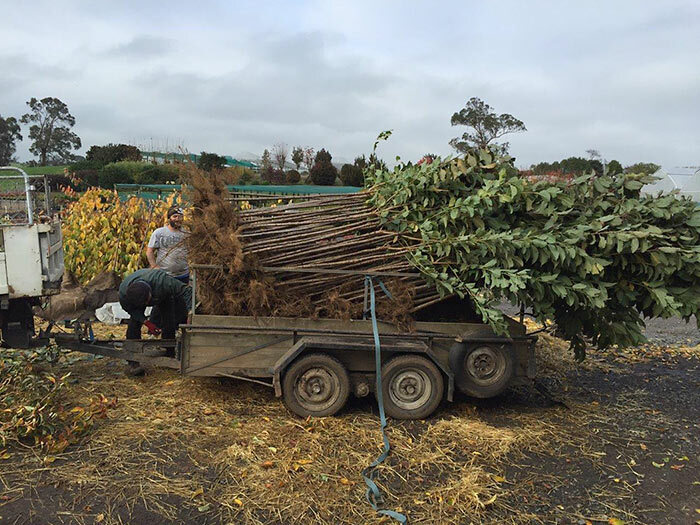 If you have a FEIJOA TREE planted in your garden you will no doubt have noticed that this month the fruit are maturing and falling to the ground! The very unique flavour of these fruit is enjoyed by everyone in the Autumn. 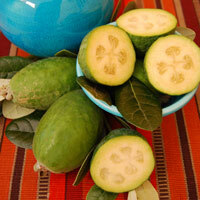 Feijoa are really easy to grow in the garden and will produce lots of fruit from an early age. 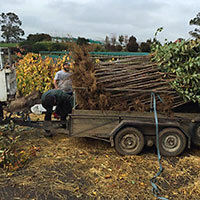 It is recommended that it is best to plant a couple of trees to get better pollination but if they neighbours have a tree you should be all good with just one tree. 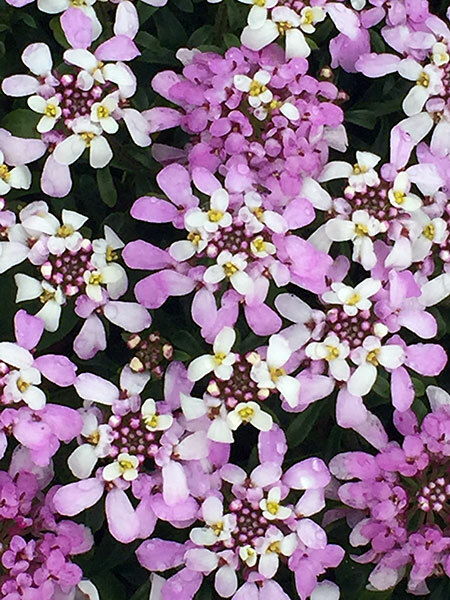 Apparently the flowers are pollinated by birds reaching into the centre of the flower to collect the sweet nectar during the winter months! Here’s a great recipe for Feijoa Chutney - we have this on our morning tea crackers every day here at work! Put all ingredients into a large pot and bring to the boil. Cook for 1 hour stirring occasionally. Spoon into hot sterilised jars. 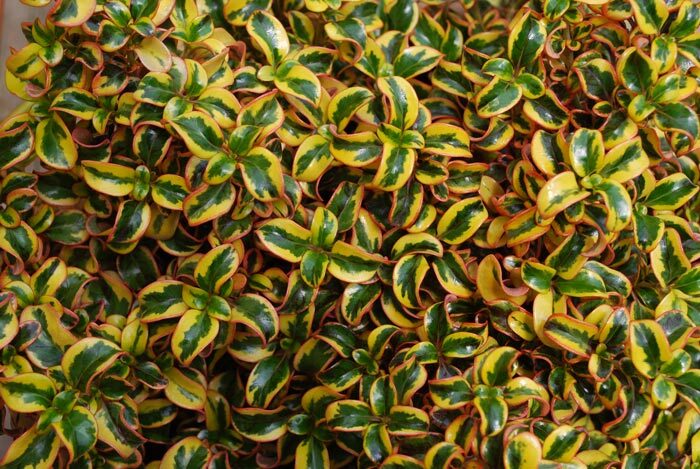 COPROSMA ‘GOLDEN STAR’ is the latest to come from our own selections and will be released to the NZ market for the first time in March. 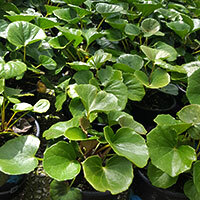 Plants will be available from garden centres in limited numbers through the autumn. 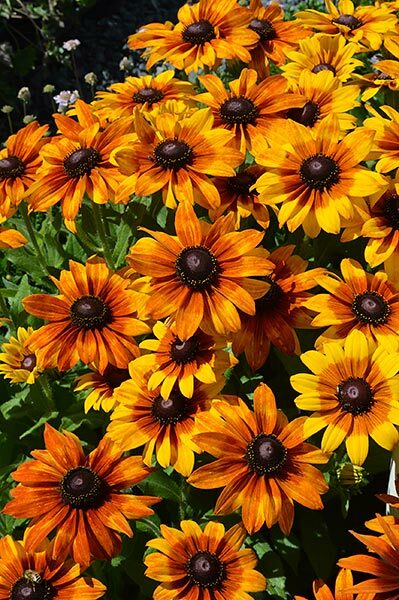 'Golden Star' has been selected for it's earthy golden tones that will fit into any garden situation. 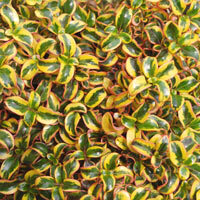 'Golden Star' will stay tidy and compact in the garden. 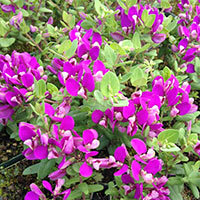 This month we release for the first time two brand new plants which are available in garden centres now. 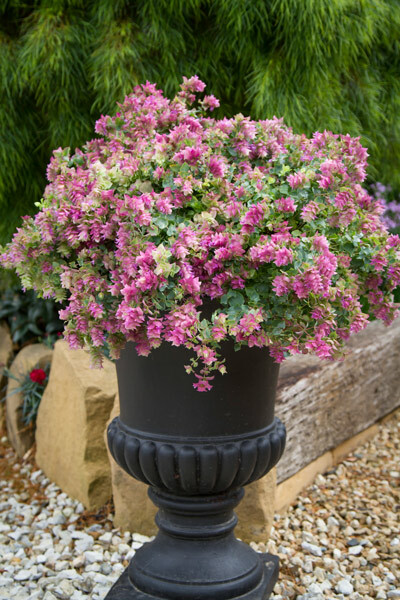 ORIGANUM ‘BELLISIMO’ comes to us from Tasmania in Australia. 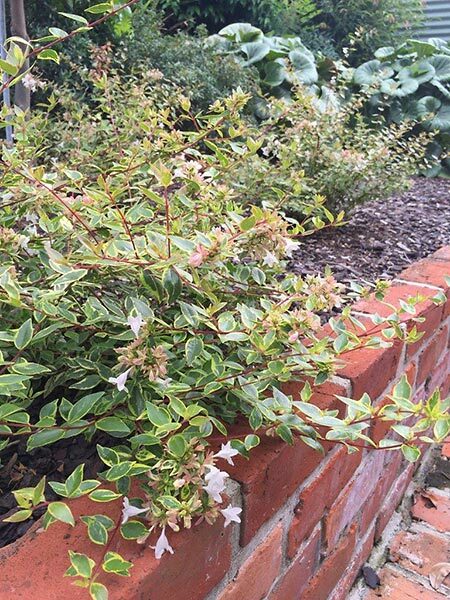 The lime green foliage is nicely aromatic when touched so it’s a great little plant to place alongside pathways or in the kitchen garden. 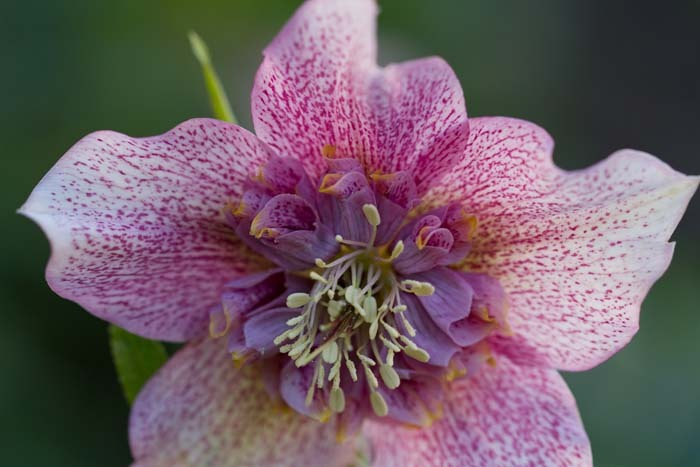 In mid-summer flower bracts appear in shades of pink which deepen to a stunning plum colour in late summer. 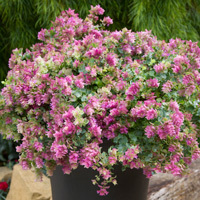 This is a really tough little plant which will tolerate the heat of summer and the cool of winter. 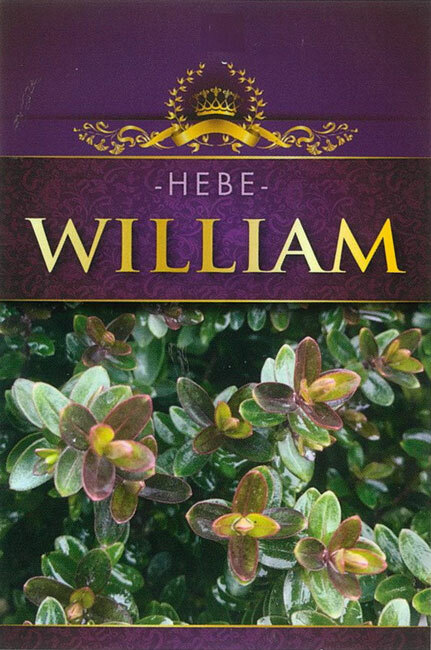 Will grow well in a full sun position in the garden. 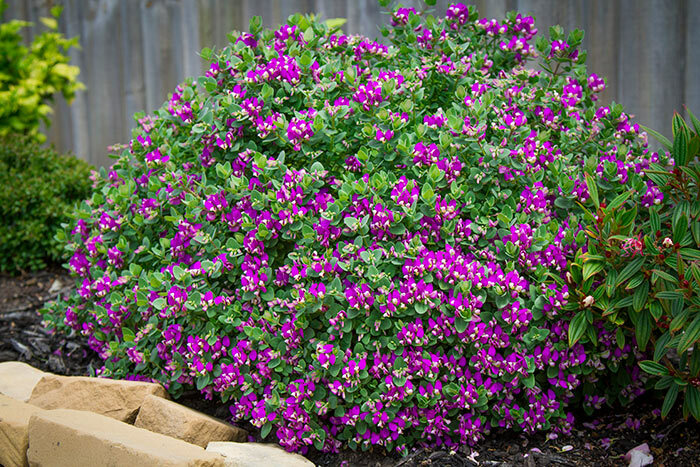 During the winter give the plant a trim to remove old flowers and new growth will come away quickly in the early spring. 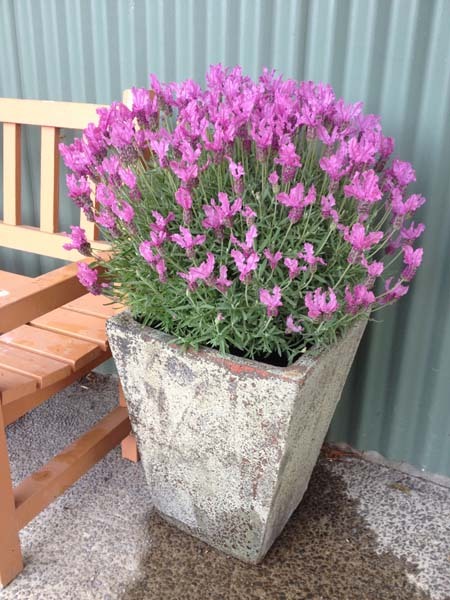 A great plant for containers or garden edges. Height about 20cm and spread approx. 40cm. 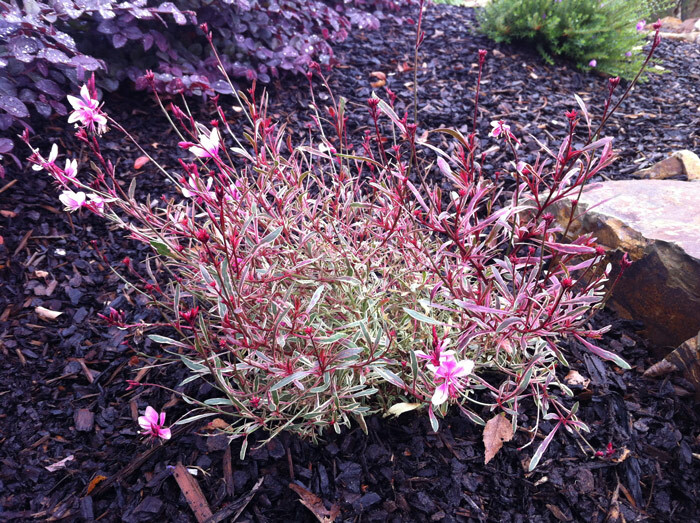 GAURA ‘PETITE RAINBOW’ is another new plant from Australia. 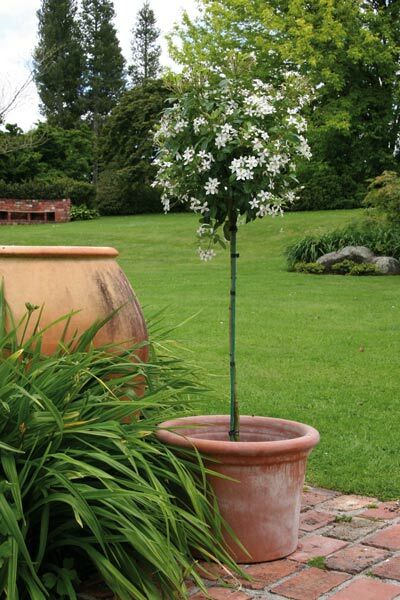 This is the nicest Gaura that we have seen for many years. 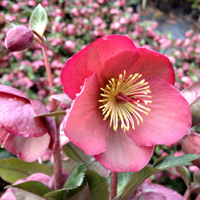 Dwarf compact growth in brilliant shades of pink and crimson which change through the year. 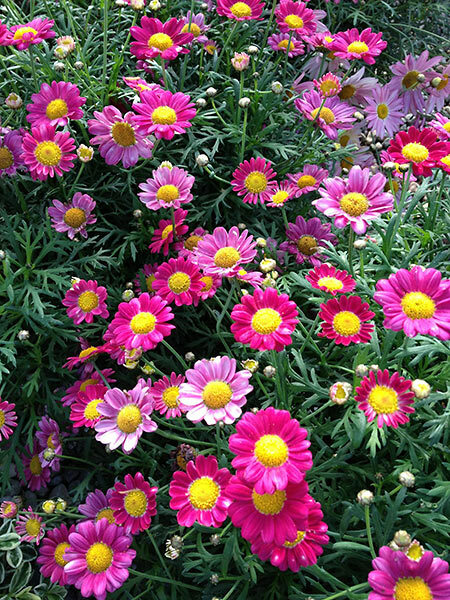 Masses of pink flowers will smother the plant through late spring and summer. 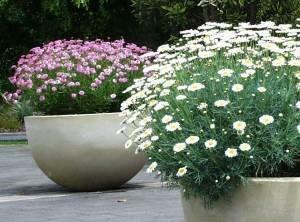 Cut back the flower heads when finished and more will come through! 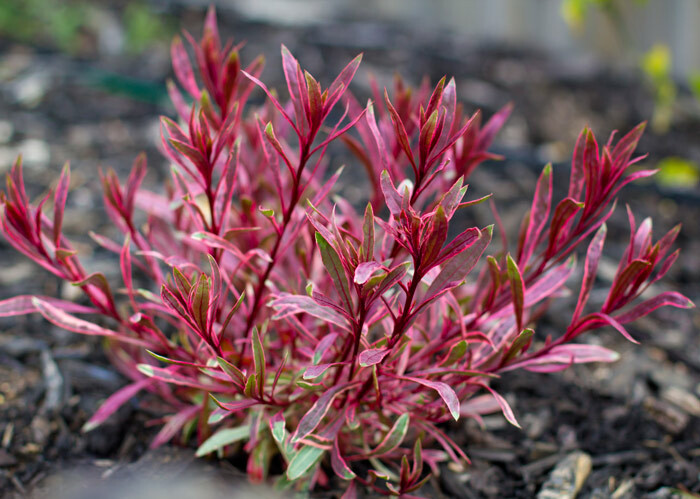 This is another tough little plant that will tolerate the heat of summer, the more heat the brighter the foliage colours! Height approx.. 40cm and spread is approx.. 60cm. 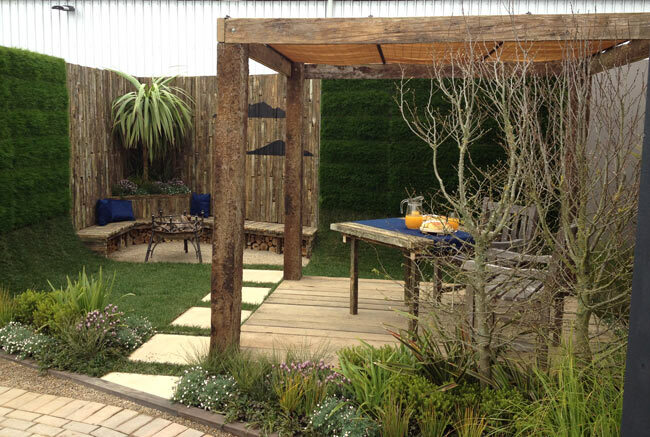 Recently our manager, Grant Eyre, was asked to judge the Landscape Awards at the Waikato Home and Garden Show. 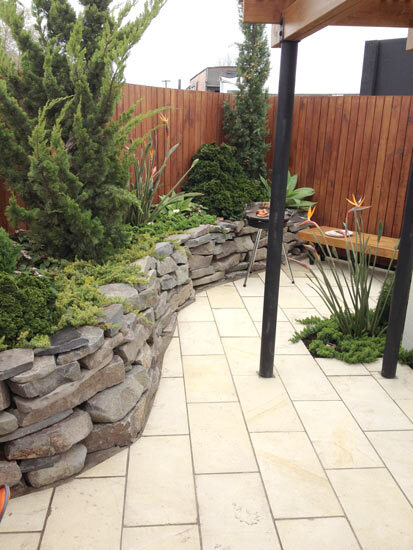 The show is in its 30th year and the annual landscape awards are a highlight of the event. 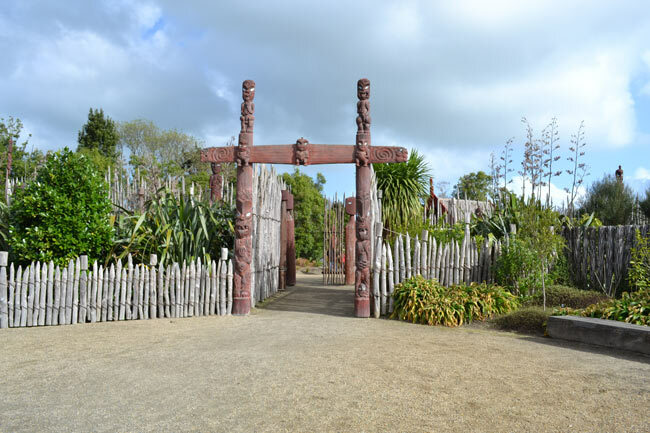 This year the theme was ‘Celebrating 150 Years of Gardening in the Waikato’ and the entrants were given an area of approximately 5m x 5m in which to create a courtyard garden.The gardens entered were diverse and of a very high standard. 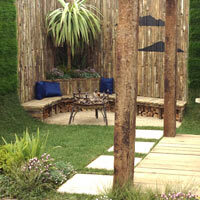 The Gold Award was presented to Denise Robinson (WINTEC) for her contemporary modernist garden. 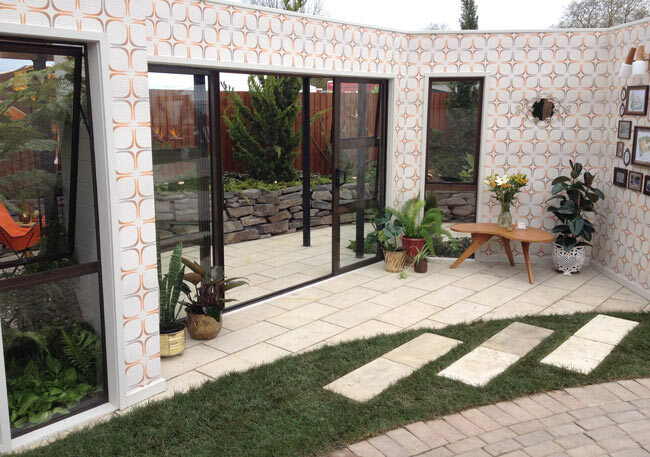 A Silver Award was presented to Kim Wood, Kowhai Landscape Design for her contemporary courtyard featuring grass walls. 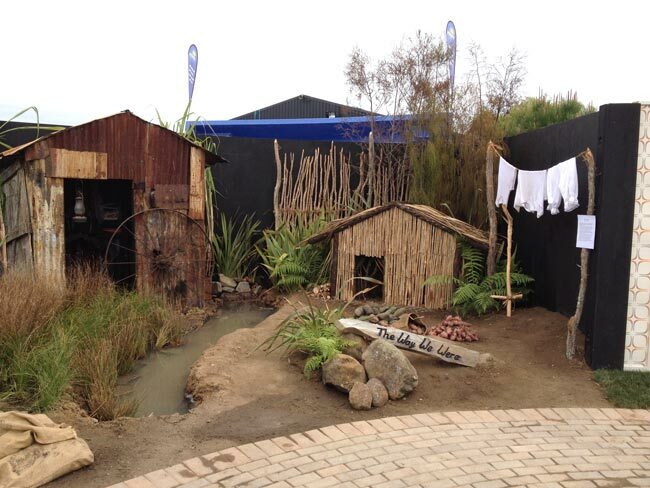 Bronze Awards were made to John Williams (WINTEC) for his ‘The Way We Were’ garden featuring a rusted truck body and a pre European Maori settlement, and to Jenny Whale (Bloom Designscapes) and Bryce Alsemgeest (Infinity Landscapes) for their modern courtyard featuring re-cycled railway sleepers. 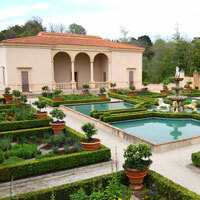 Hamilton Gardens has received the prestigious International Garden of the Year award. 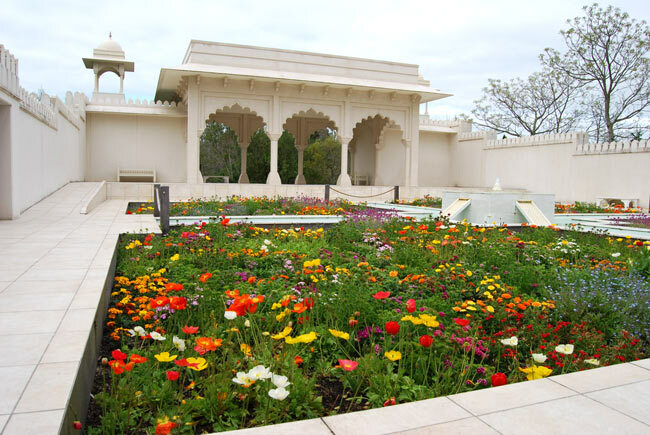 The win was announced on 1st October 2014 as part of the 2014 Garden Tourism Awards held at the International Conference Gardens ‘Without Limits’ conference in Metz, France. 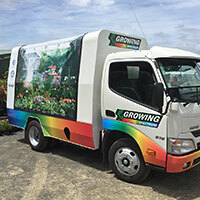 Growing Spectrum has supplied many plants to the Hamilton Gardens Complex through its development and are proud to be associated with this wonderful asset in the Waikato Region. Have you checked out our Facebook Page?. 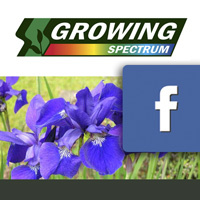 We have regular promotions and keep you up to date with what has been happening at Growing Spectrum. 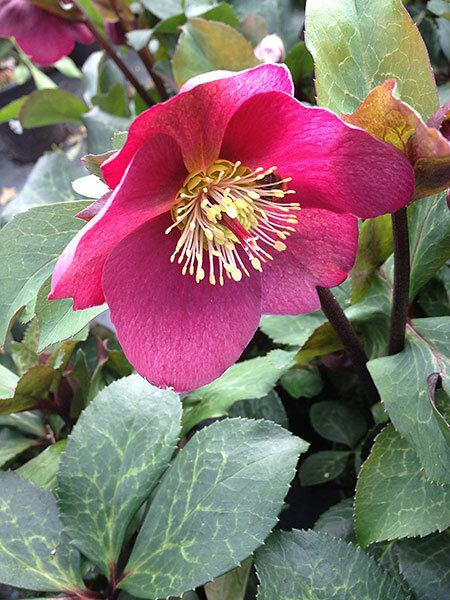 This month on Facebook we introduced the new variety Helleborus 'Anna's Red' which will be in stores this month.